Patterson was an immensely fast driver, look closely and you can see his left hand proud of the wheel as he gently corrects the powerful little cars slide on the testing, wonderful Collingrove Hill. 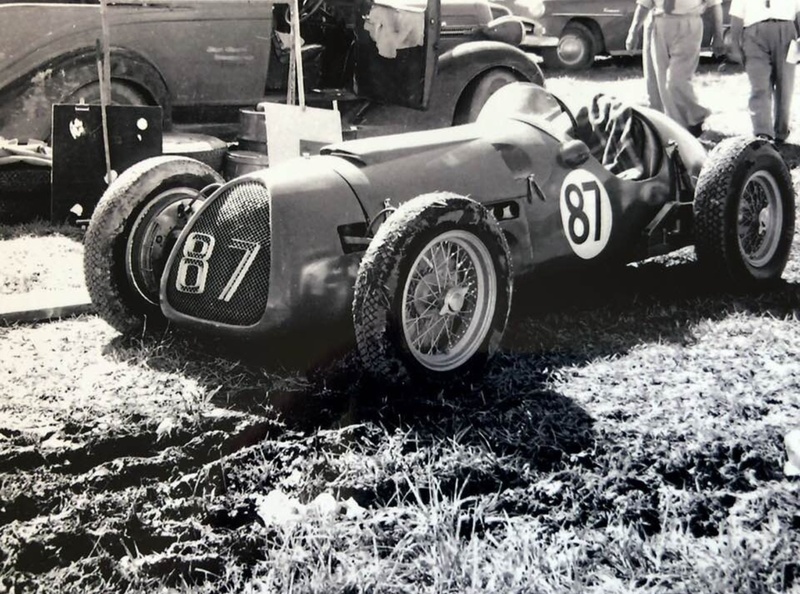 I wrote a short article about this Cooper, chassis # MkV/41/51 a while ago, that article was inspired by a photo, as is this one which covers the history of the car and of Bill Patterson, an Australian champion driver. Click here for the earlier article which provides information about air-cooled Coopers generally, and the MkV specifically. 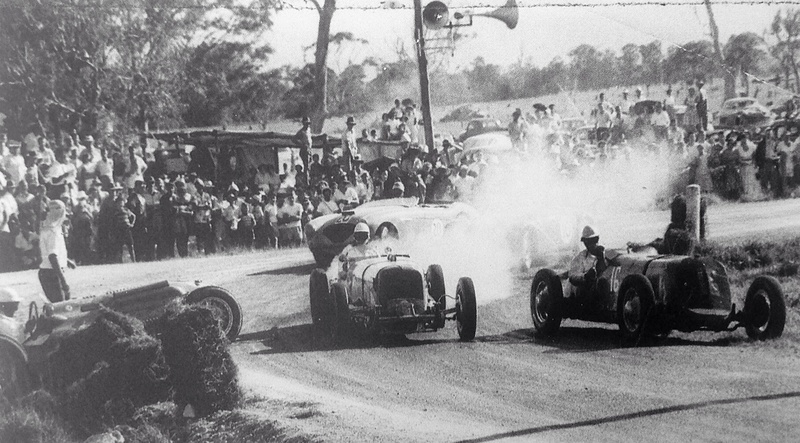 The wealthy Victorians arrived in mid 1951 with the intention of having a racing holiday. Tom was to buy and prepare the car and Bill was to drive it. John Crouch, the Australian Cooper Distributor arranged for delivery of a newly released Cooper MkV to the duo but it was fitted with a JAP 500cc engine rather than the more reliable Norton ‘double knocker’ which was simply unobtainable. 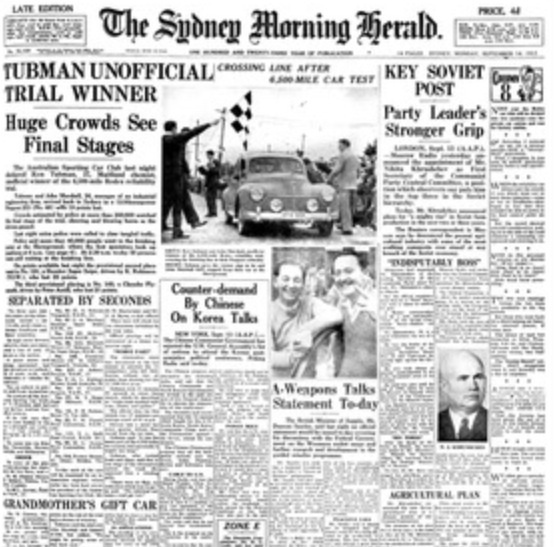 The car was specced with long range tanks with longer races in Australia in mind. 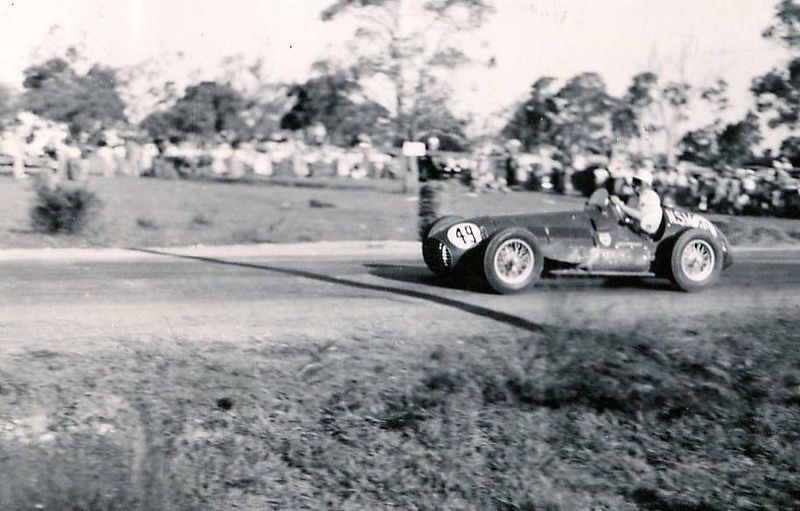 He arrived razor-sharp back in Australia after the intense competition of F3 in the UK and Europe first racing in Australia at Parramatta Park, Sydney in January 1952. 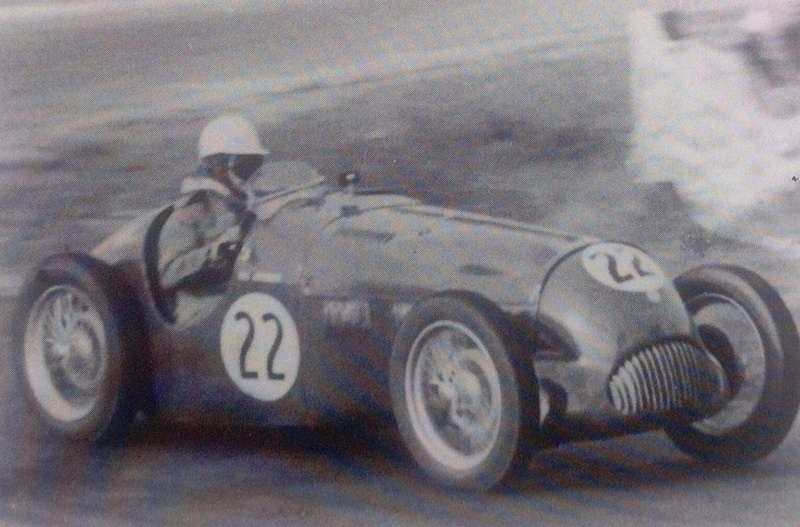 Stan Jones then bought the Cooper in a deal in which Tom Hawkes acquired Stan’s Allard J2. 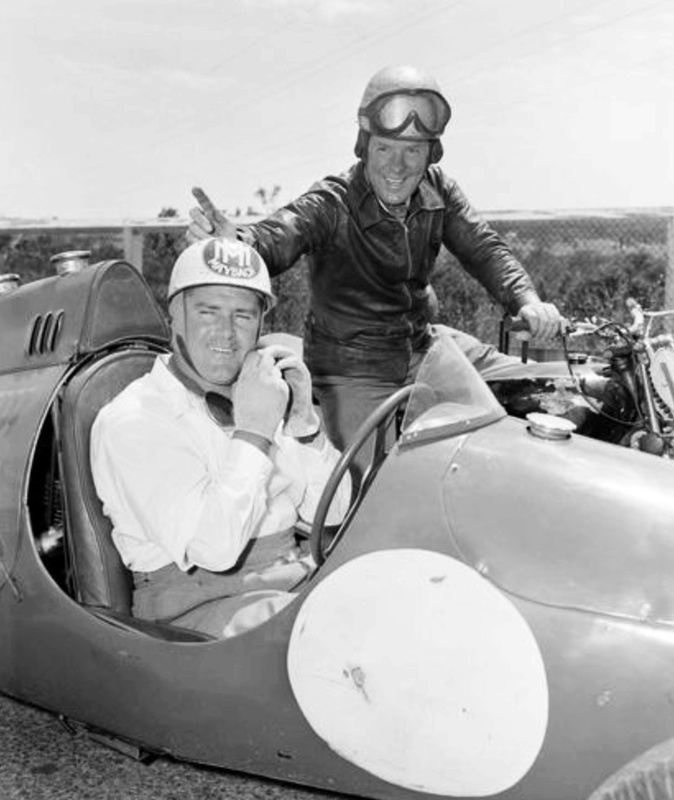 But Patterson shared the racing with Stan before eventually buying the car in 1954. 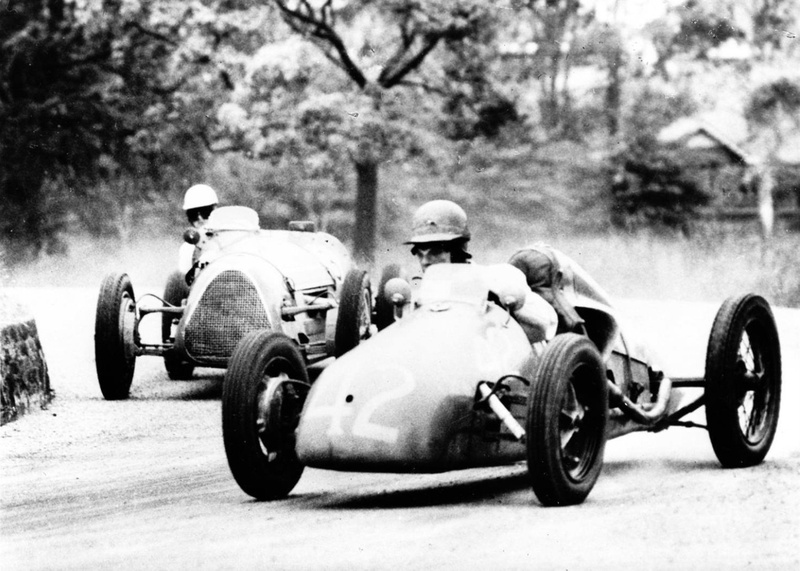 A JAP 998cc engine was fitted, the car first raced in this form at Rob Roy Hillclimb in outer Melbourne on 28 February 1954, Patto won the 1954 AHCC in it as detailed earlier, as well as the 1955 South Australian Hillclimb Championship, also at Collingrove. 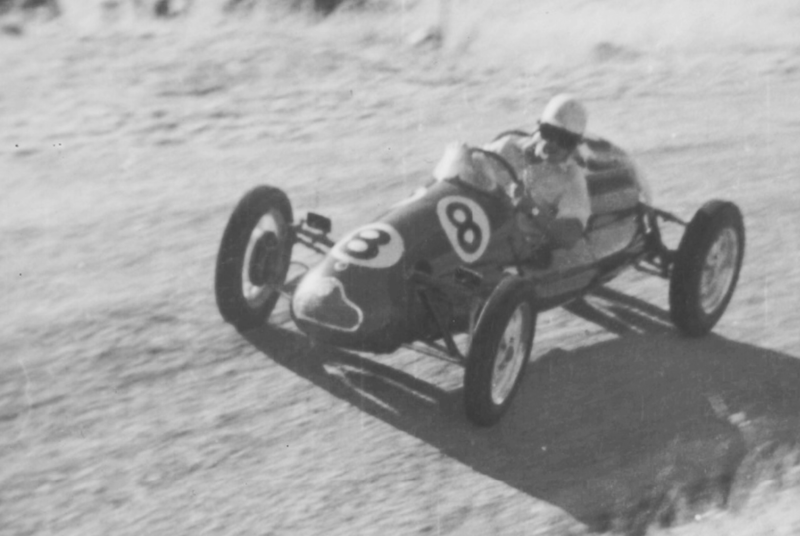 The little car contested the 1955 AGP at Port Wakefield with Patterson at the wheel with a JAP 500 fitted, he retired. In fact the mates Jones (Maybach), Hawkes (Cooper T23 Bristol) and Patterson all retired from the AGP, won by Jack Brabham’s Cooper T40 Bristol, Jack having made his F1 Championship GP debut in that car at Aintree several months before. 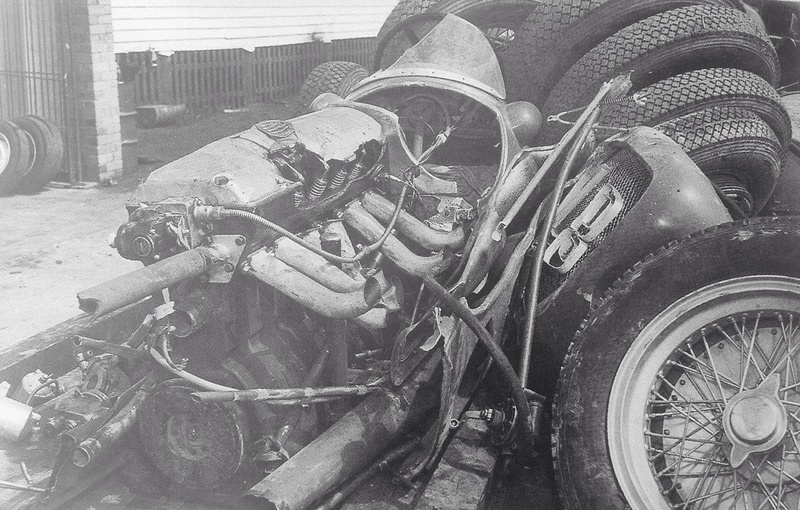 The car passed into Ken Wylie’s hands who raced it with both Norton 500 and JAP 1000 engines before crossing Bass Straight to Jock Walkem in Tasmania, he fitted a JAP 1000. 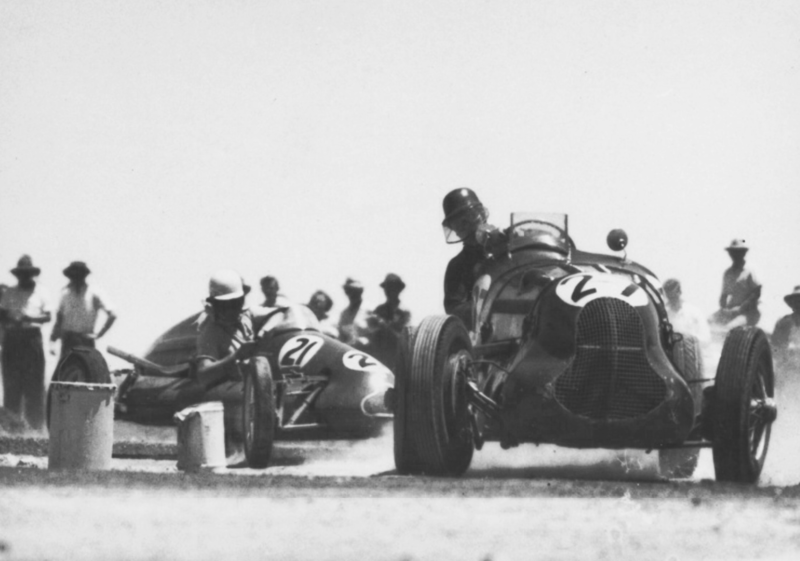 The car came back to the mainland, Victorian John Hartnett raced it with both JAP 500 and 1000cc lumps. It then went back to Tassie, raced by both Dave Powell senior and junior powered by JAP 500, 1000 and 1100 motors as well as a BSA 500 engine. The car was then sold to Peter Dobson and passed to Brian ‘Brique’ Reed who restored it in the 1970’s. After many years of ownership it was bought by Peter Harburg. Patterson, was born on 30 August 1923 into a family of considerable wealth. He was the son of Wimbledon tennis champ Gerald Patterson and a nephew of famous Australian opera singer, Dame Nellie Melba. Gerald Patterson was the Wimbledon singles champion in 1919 and 1922. He represented Australia in the Davis Cup from 1919-1928 and in 1927 won the first Australian singles title at Kooyong until the modern era, the home of Australian tennis. Patterson fought in the Great War and was decorated for his bravery, being awarded the Military Cross as a member of the Royal Field Artillery at Messines in 1917. By the time his tennis career was over he had embarked on a very successful business career initially with sporting goods manufacturer AG Spalding Bros, by 1935 he was its CEO and went on to become a director of some other well known companies of the time. 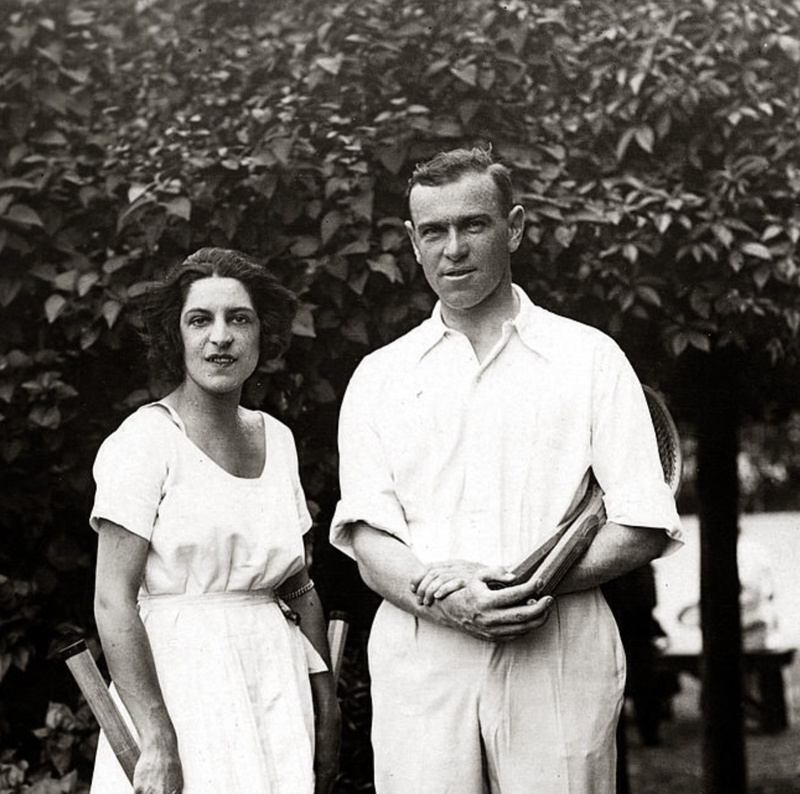 Bill was born into a life of privilege, initially growing up at 15 Barry Street in Kew, the scene of many society parties and events including tennis matches on the home’s grass court. The family soon moved to nearby Toorak, Melbourne’s suburb of the ‘great and the good’. He attended Scotch College in nearby Hawthorn, leaving in 1934 to attend Geelong Grammar, his sporting intent and prowess apparent as a member of the school’s rowing First VIII in 1938. Born into such circumstances is a double-edged sword of course, being the son of an elite sportsman-and businessman is seldom an easy thing given the expectations foisted upon the child. 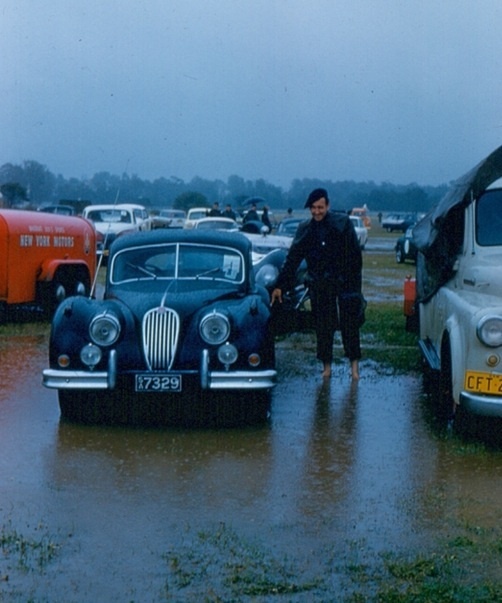 I am intrigued to know what Bill did when he initially left school, he first came to motor racing prominence driving one of the first MG TC’s delivered to Melbourne post-war. 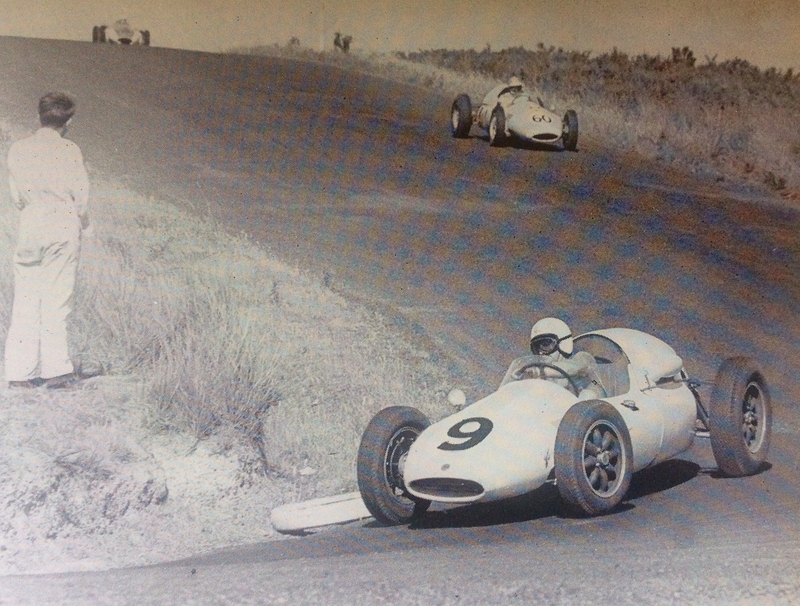 His first event appears to be the 11th Rob Roy Hillclimb on 24 November 1946. This car was soon replaced by a second TC which was stripped and tuned. He contested the 1948 Australian Grand Prix at Point Cook in outer Melbourne in this TC, which was fettled by Reg Nutt. The race is famous for the intense heat of the meeting which forced many of the top runners to retire from the impacts of the heat on either their mount or themselves. By lap 13 Patterson led the race, aided by a pretty good handicap. The car retired from the race, boiled dry on lap 24. 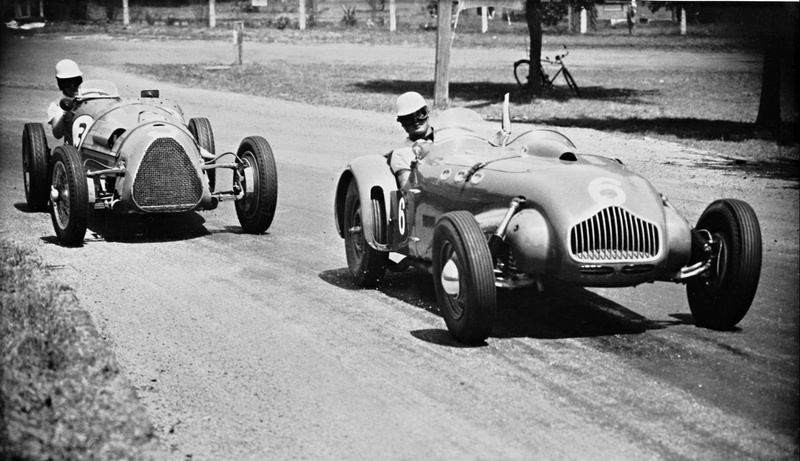 The event was won by Frank Pratt’s BMW 328, which like Patterson, was aided and abetted by a good handicap. 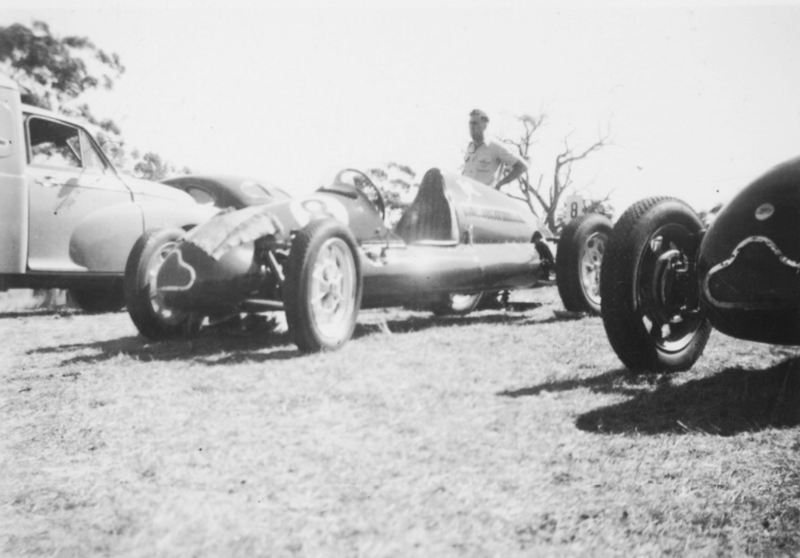 Soon after the AGP Patterson and later Australian Grand Prix three times winner Doug Whiteford built a stripped, lightweight, two seater TC Special which had a curvaceous aluminium body made by Bob Baker in Melbourne. The engine was fitted with all the trick bits of the day and was supercharged, a Marshall blower was fed by a 1 3/8 inch SU carburettor at a boost of 10psi. The car was powerful, finned drum brakes were fitted as well as adjustable shock absorbers. 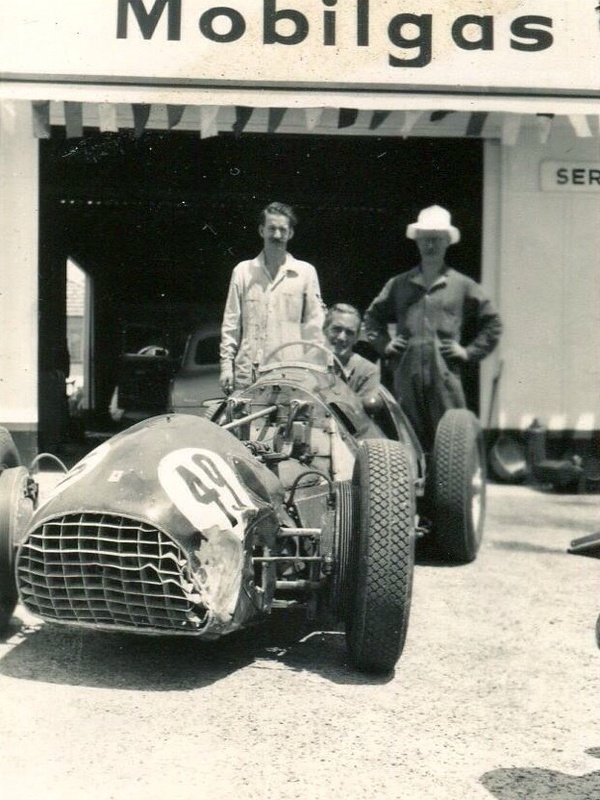 This famous little car, which still exists, first appeared at Rob Roy in January 1949, it’s first race was at Fishermans Bend in March. The car was fast from the start but Patto’s nemesis in under 1500cc events was Ken Wylie’s Austin A40 Spl. 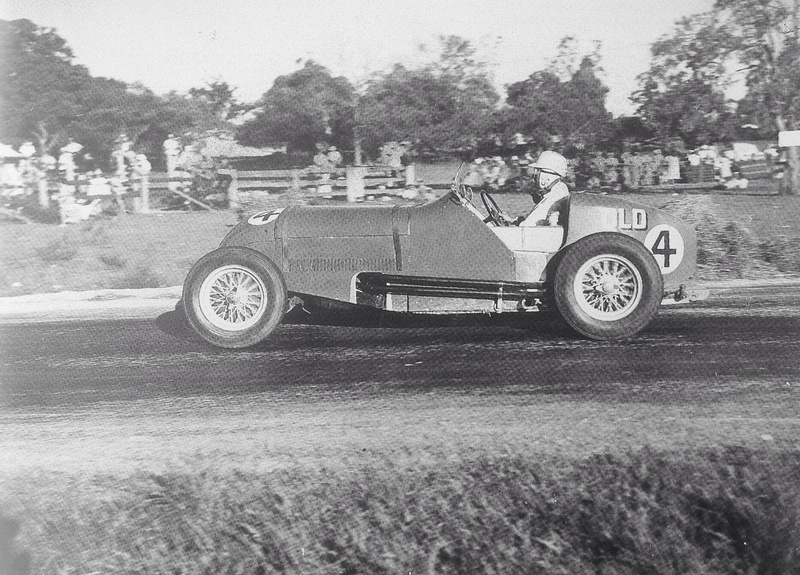 The MG first won at Nuriootpa in April 1949. 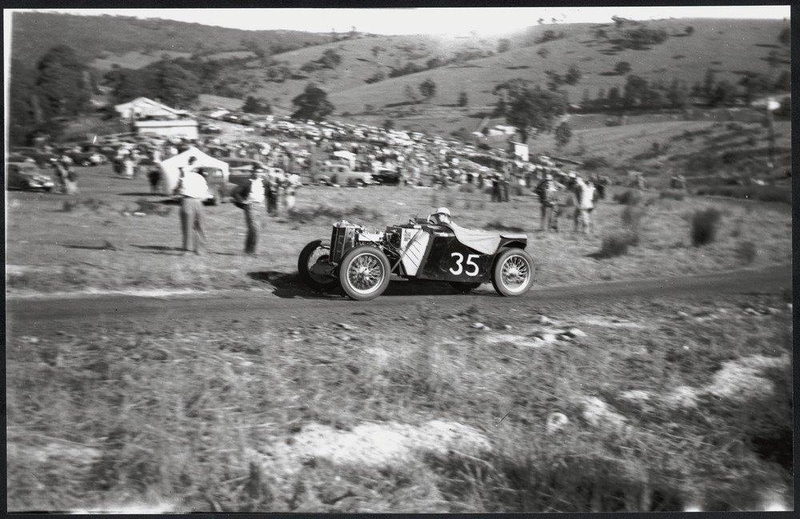 Back in the Barossa Valley, Patterson contested the 1950 AGP at Nuriootpa in South Australia and was on hand to see his friend Whiteford win in ‘Black Bess’ Doug’s Ford V8 Ute based, amazing, special. Patto’s TC blew a head gasket on lap 6 having had a torrid dice with Stan Jones HRG in a preliminary race, Stan did not start the race. 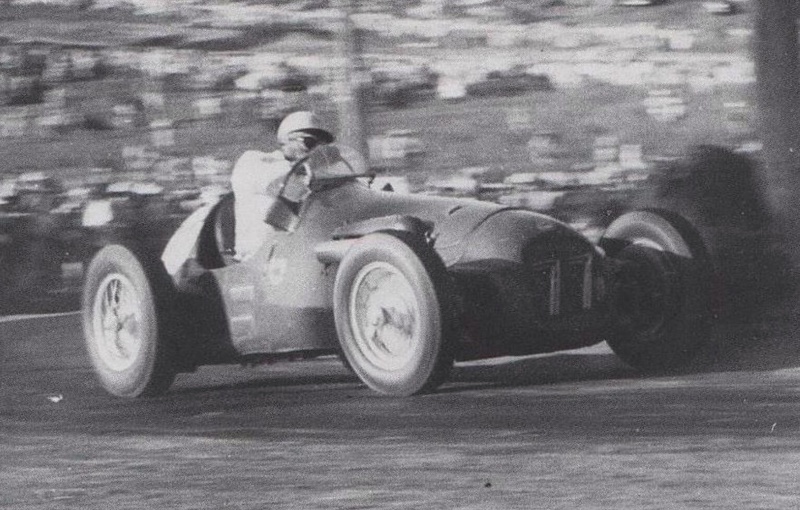 At Bathurst in Easter 1950 he did a lap of 3:17 seconds, the fastest a 1500cc car had been around the demanding mountain circuit. 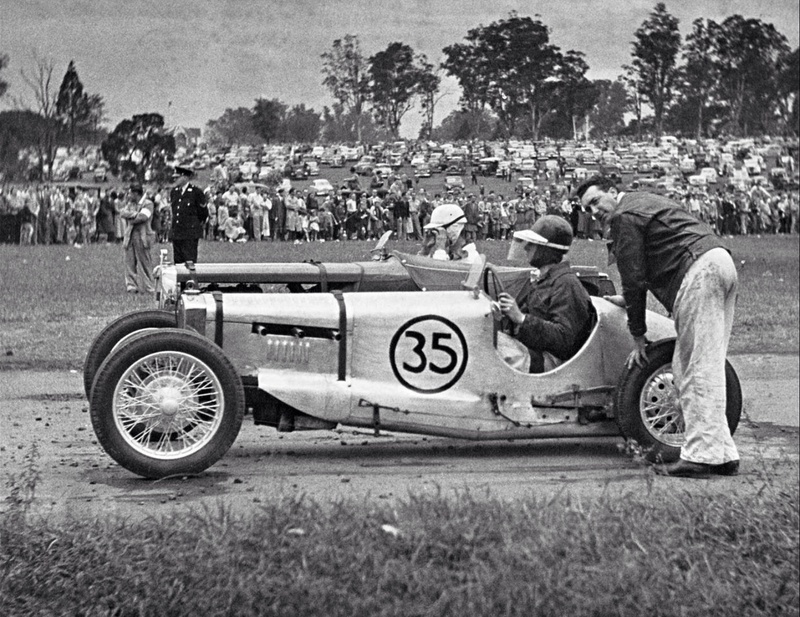 John Medley observed in his ‘Bathurst Bible’ ‘The lightweight green car had an impressive collection of wins to its credit and was probably then Australias fastest MG…the driver was to become one of Australia’s fastest’. Of great interest to Patterson was the appearance at Bathurst of the first two Coopers in Australia. 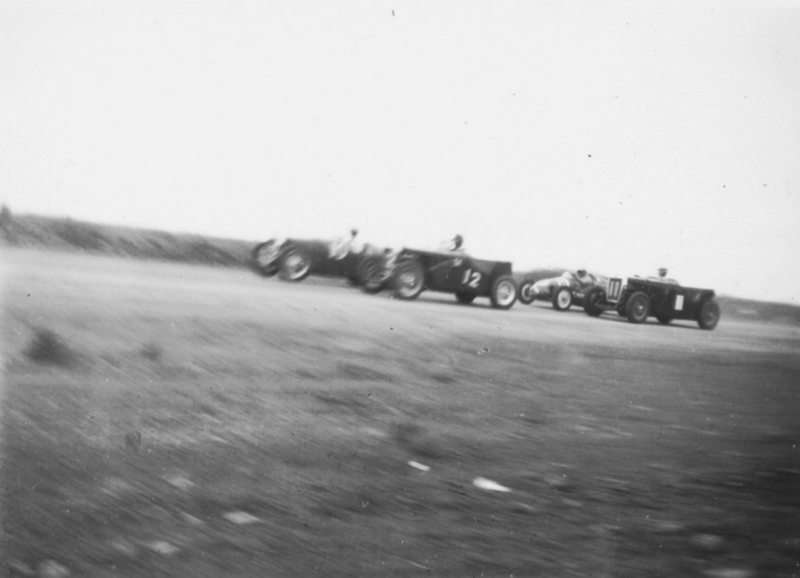 The cars, MkIV’s, were raced by Keith Martin/Arthur Wylie and Jack Saywell. 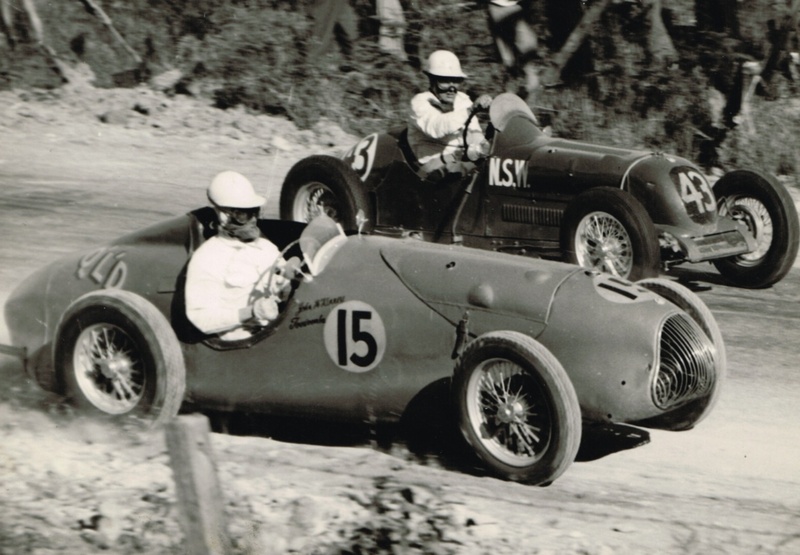 These ‘very light, 600lbs dry and with 82bhp 995cc JAP motors, all independently sprung MkIV Coopers, were, for their competitors, a taste of tomorrow’ said Medley. Patterson had a very successful meeting with the TC at Balcombe on Victoria’s Mornington Peninsula in June 1950 with two wins and two seconds. 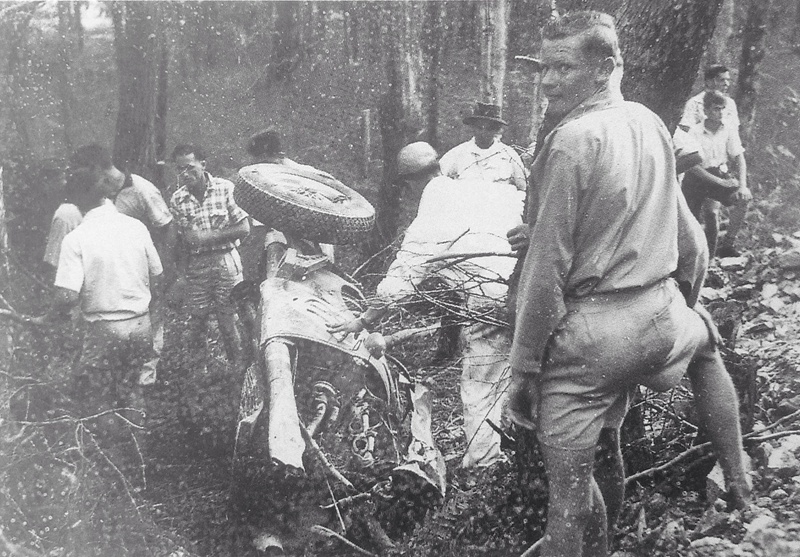 Not long thereafter the car was sold to Sydney’s Curly Brydon who also did well with the car, developing it further. 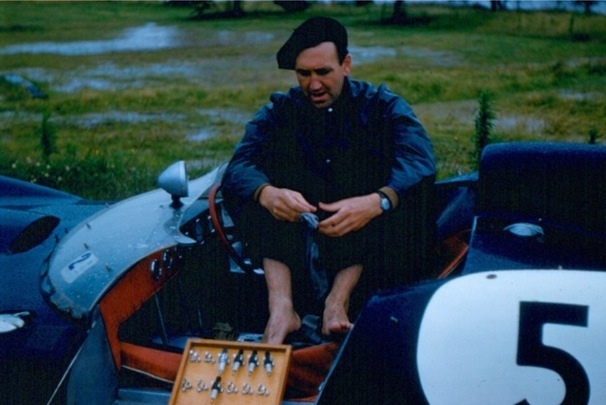 For Bill Patterson though, the path was clear, he was off to the UK to race a Cooper in British 500cc F3, the toughest training ground of all at the time. 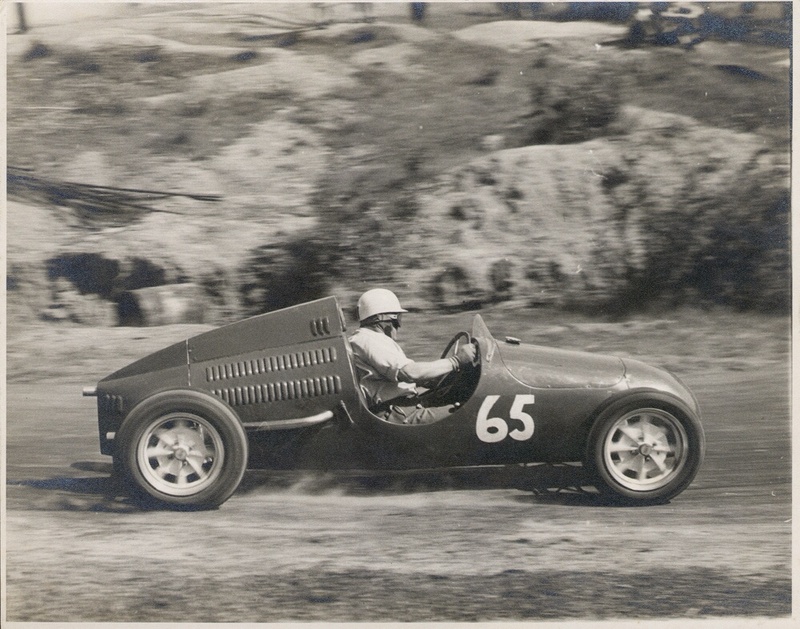 Patto contested the Round Australia Trial in a Holden and a Peugeot, and other than a brief Ferrari flirtation which fell into his lap, he was pretty much a Cooper Man for the rest of his racing career. 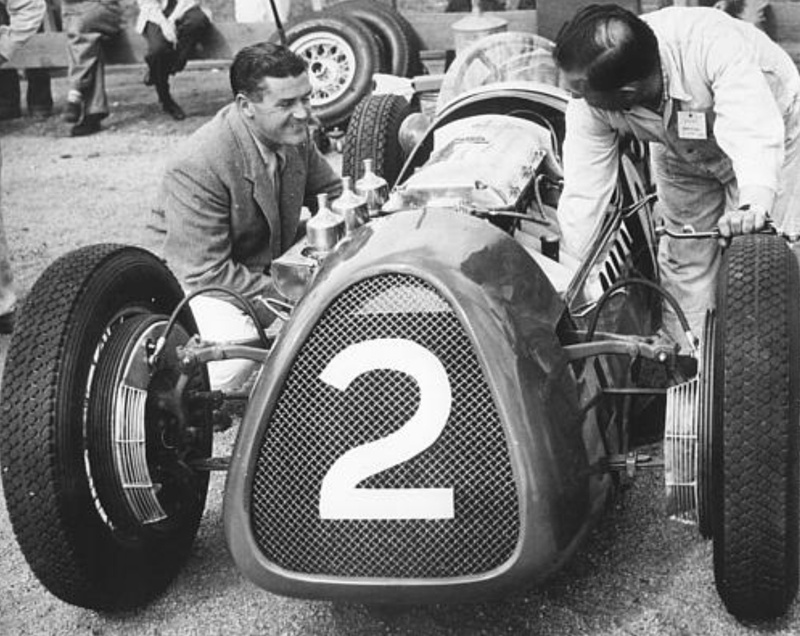 After his 1951 season and the continuation of his career with the MkV in Australia covered above, he finally sold the little air-cooled bolide and bought his first Coventry Climax engined Cooper. 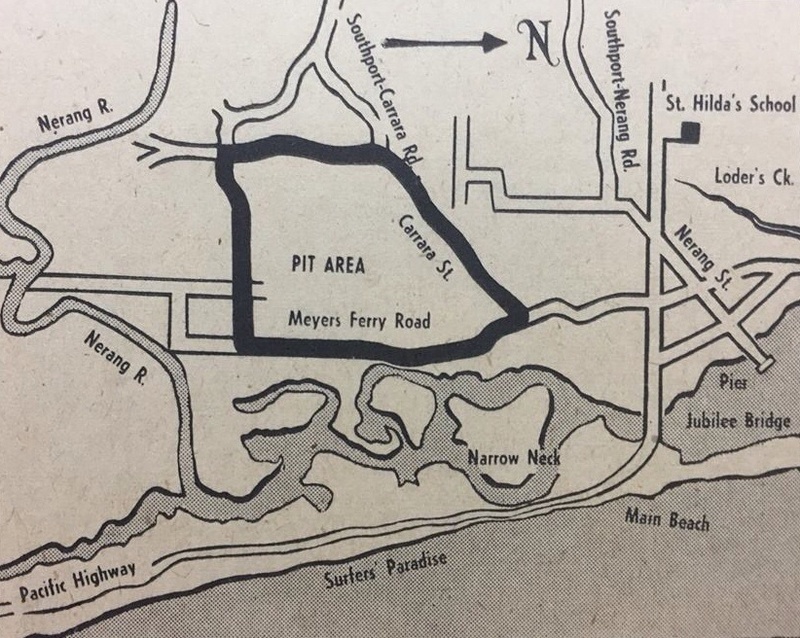 This mid-fifties period coincided with the commencement of his Holden dealership, let’s spend a moment on that before picking up Patterson’s next Cooper. The Australian economy boomed in the 1950’s buoyed by the pent up demand of wartime austerity, global demand for our products, wool, wheat and goods produced behind high tariff walls, high levels of migration from war-torn Europe and greater availability of consumer credit. The ‘great Australian dream’ of owning a home and a car were now within reach of larger numbers of people than ever before. 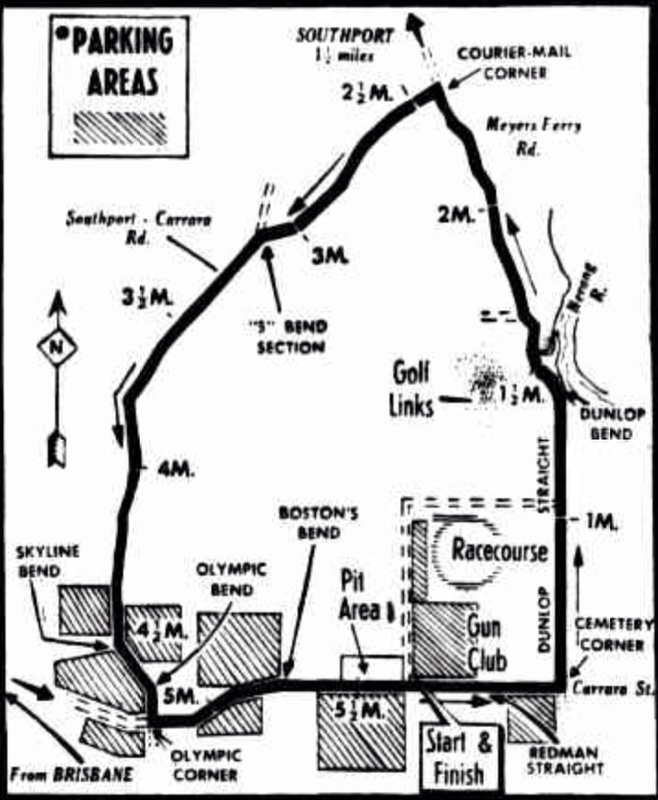 In 1955 (Bill Patterson Motors Ltd was incorporated on 3 October 1955) Ringwood was very much on the eastern urban fringe of Melbourne (30Km) as the city marched, for the reasons outlined above rapidly in every direction other than into Port Phillip Bay! 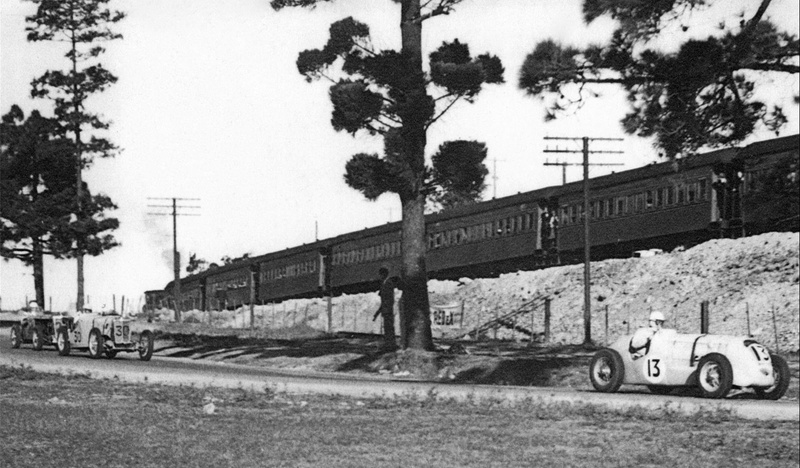 Surrounding suburbs of Mitcham, Heathmont, Vermont and Croydon were served by better roads into Melbourne and train lines. The middle class were Holdens target market, Bill chose his location wisely. As the local populace and their incomes grew so too did Holdens range of cars, Patterson added BMW to the mix in the 1970’s, another great choice of a marque not well known in Oz, and on the rise. Patterson’s Ringwood premises were initially modest but by 1959 he had built a state of the art dealership at 55 Maroondah Highway, just at the bottom of the downhill drop below Heatherdale Road, designed by Hassell McConnell Architects, Hassells are still one of Australia’s best architectural outfits, a global one at that. I can well remember as a kid visiting my aunt in Mitcham ‘out in the sticks’ as my father described it, and the impact of Patterson’s big site whenever we were in the area. The point here is that Patterson, did things well and thoroughly. It helped that he had access to, probably, family working capital but he invested wisely and ran a very strong operation for decades. In a previous life I worked as a consulting accounting/financial advisor to motor dealers for 7 years or so and worked with over 20 dealers across many franchises, not Patto I hasten to add. They are complex businesses; effectively 5 enterprises under one roof-new cars, used cars, service, parts, plus finance and insurance. Add to that the property aspects. Lots of people think dealerships are ‘money for jam’. They are not, the space is incredibly competitive and the profit margins thin. The investment in infrastructure is significant. They need to be very well run with great, ongoing vigilance around daily detail to make good money. 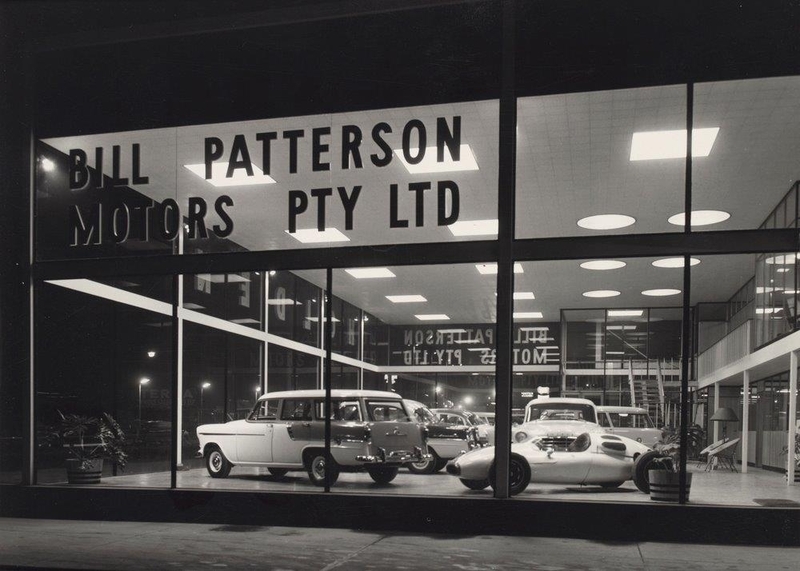 Patterson was one of Holden’s best dealers for decades, consistently in their Top 15 nationally and the figures were distributed monthly by GM, the peer pressure relentless and ongoing! 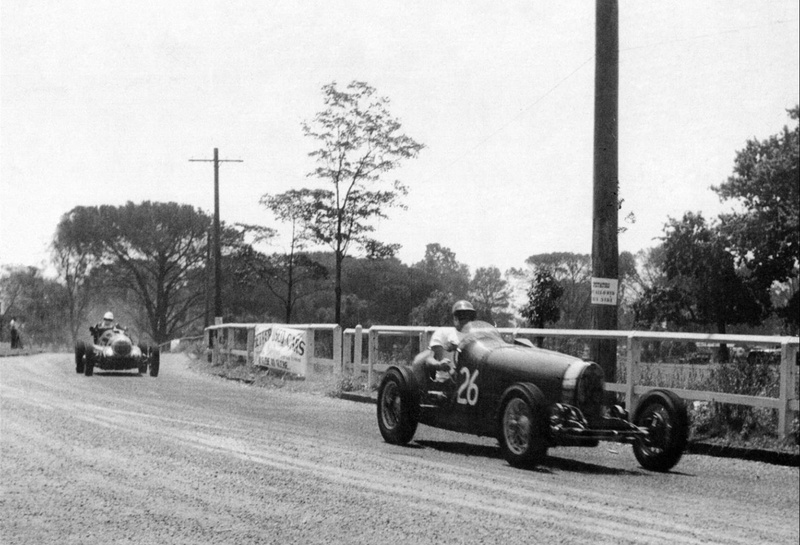 At the top of the GMH tree, by the way, was often fellow Victorian, former champion racer Reg Hunt, his huge site on the Nepean Highway in Elsternwick well known to many Australian race fans. Back to the racing. 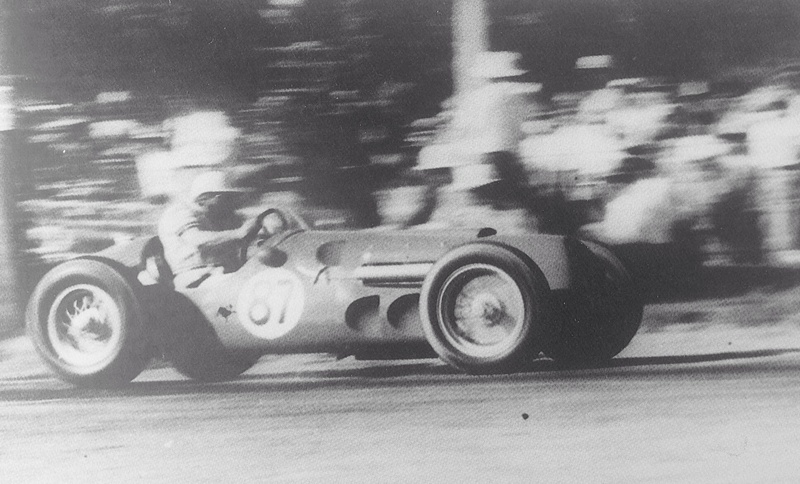 In 1956 Patterson imported a Cooper T39 Climax, #CS/12/56 a sportscar powered by a Coventry Climax SOHC 1500cc engine. 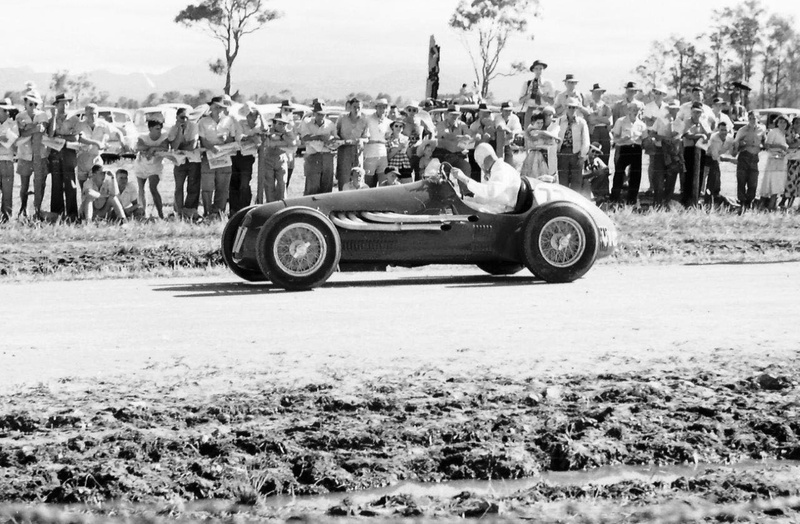 The car first raced at the Albert Park Olympic AGP Meeting in November 1956, he managed to roll it at the end of the straight during the Australian Tourist Trophy won by Moss’ works Maserati 300S! Damage was superficial. Quickly repaired the pretty little car won its class and was 3rd outright in the Argus Trophy in the second weekend of the two part meeting. 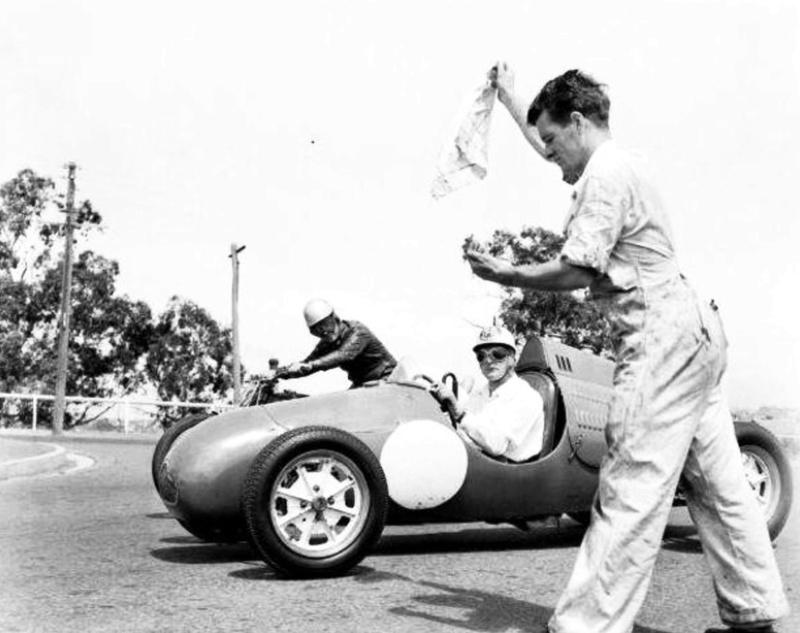 The car was pretty much unbeatable in its class, Bill took it to Caversham for the 1957 Australian Grand Prix held in WA, Caversham is 16 kilometres from Perth. 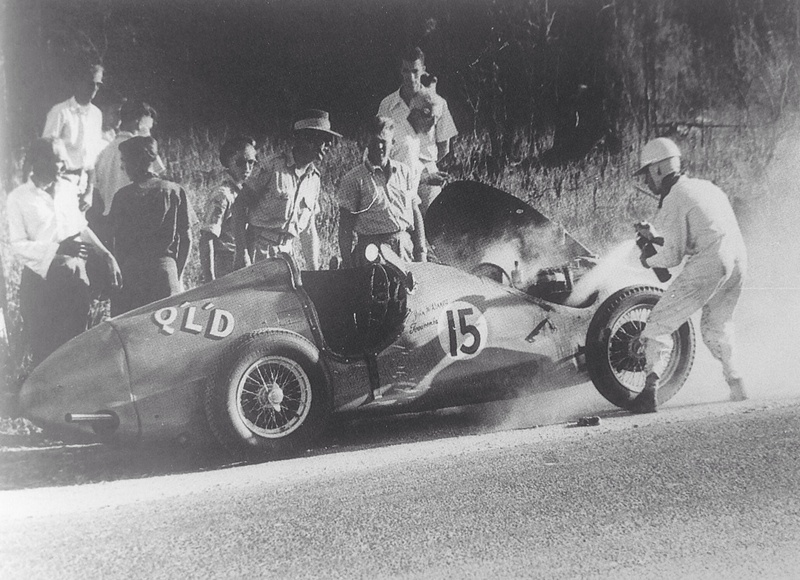 He stripped a gear in the first heat and, unable to race the car, became relief driver for Lex Davison’s ex-Ascari/Gaze Ferrari 500/625 winning the race with Davo in searing heat. Bill did some laps whilst Davison was treated for the effects of heat before returning to the event. 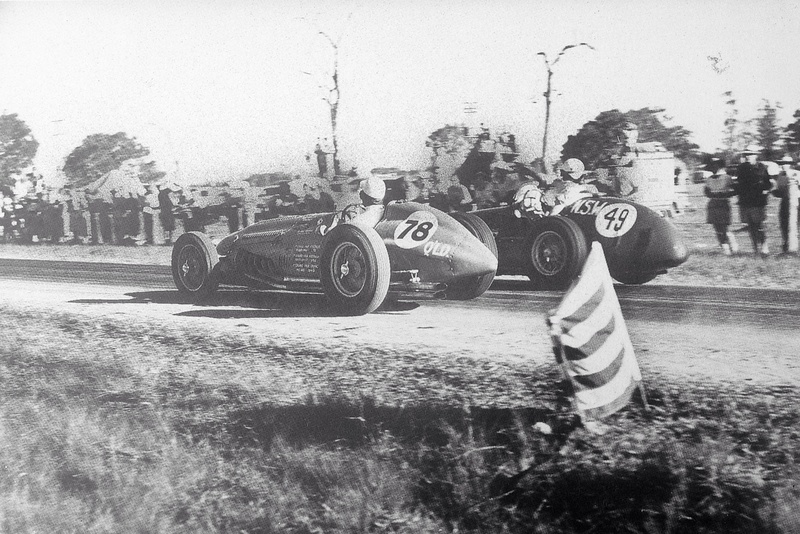 The win was in somewhat controversial lap scoring circumstances from Stan Jones, who raced solo in his Maser 250F. 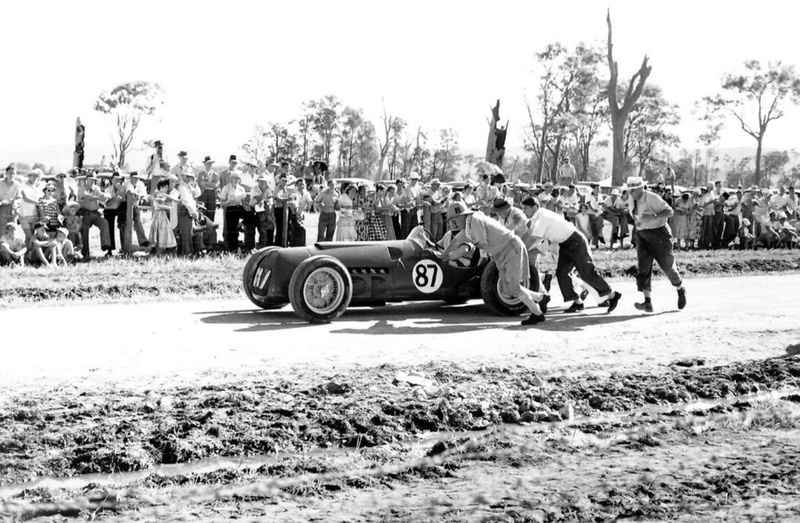 Patterson was 10th in the 1957 Gold Star Championship, the first year in which this for many years prestigious championship was run. Davison won the award in his Ferrari. 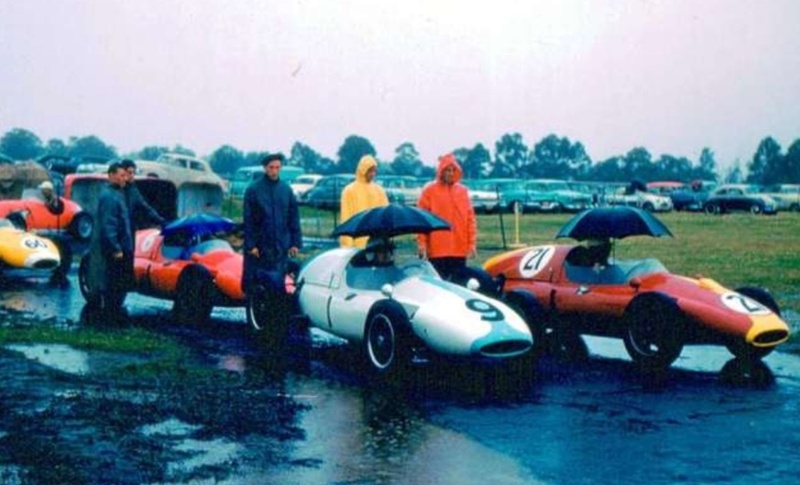 The Cooper T39 sports was sold when Bill bought the ex-works Jack Brabham Cooper T43 Climax #F2/9/57 which Jack brought to Australia to race at Gnoo Blas, Orange in January 1958. Jack sold the car to Bib Stillwell, the first of many cars Jack sold to Bib! 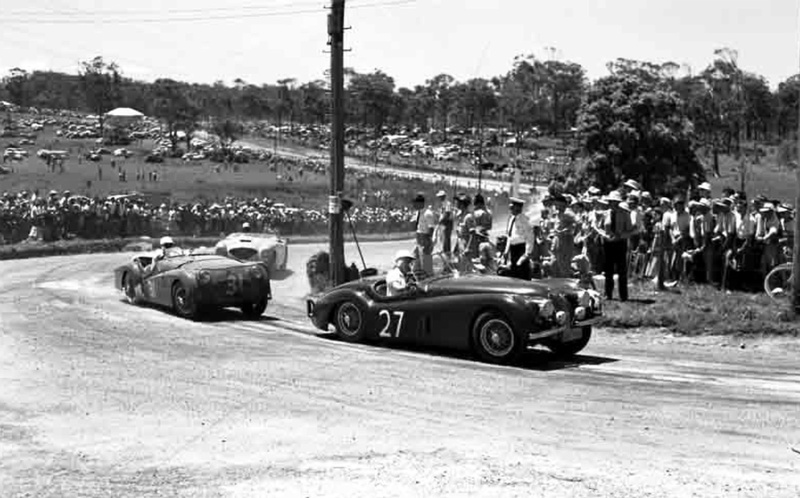 Bib sold the car shortly thereafter to fellow Melbourne motor trader Patterson after Stillwell repaired it; he rolled the car at its second meeting in his hands at Bathurst, Easter 1958. 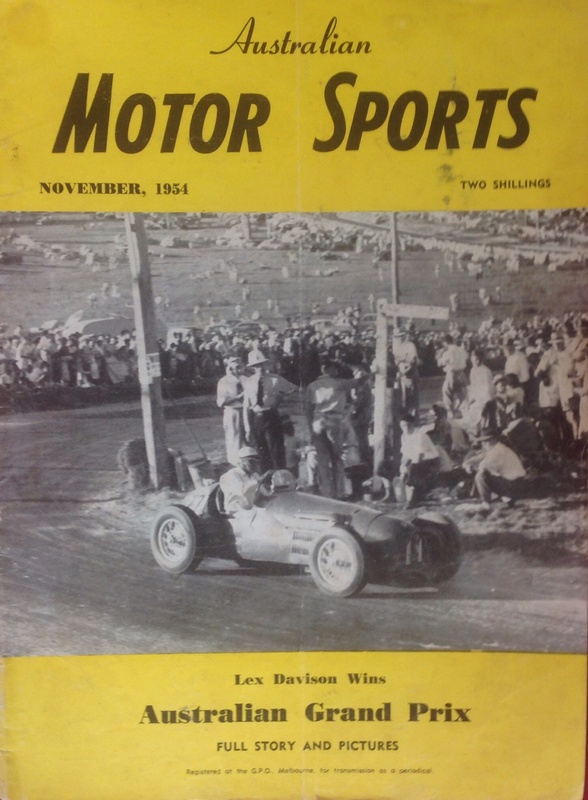 Bill first raced it at Lowood, Queensland in 1958, and later in the year at Bathurst in the Australian Grand Prix, a great race won by Davison’s evergreen Ferrari 500/625. 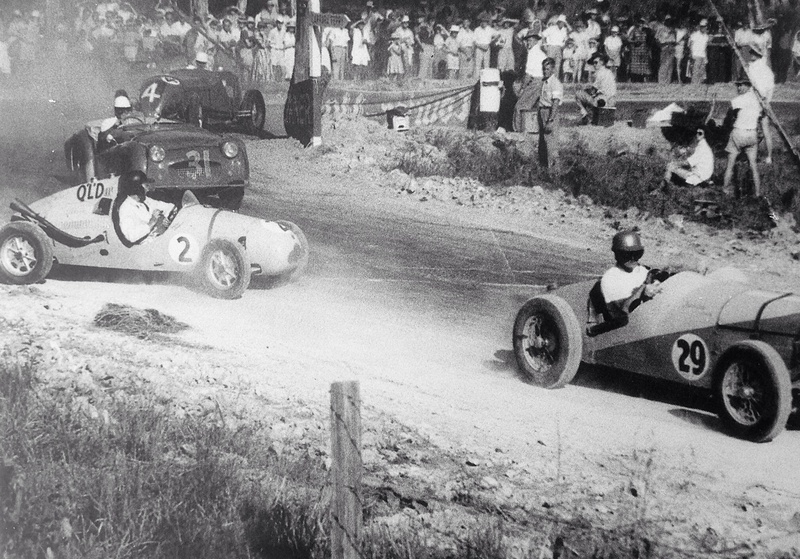 Bill qualified the 1760cc Climax engined car well, on row 4 amongst much more powerful machinery. But he was out of luck again, this time not taking the start with a blown head gasket. 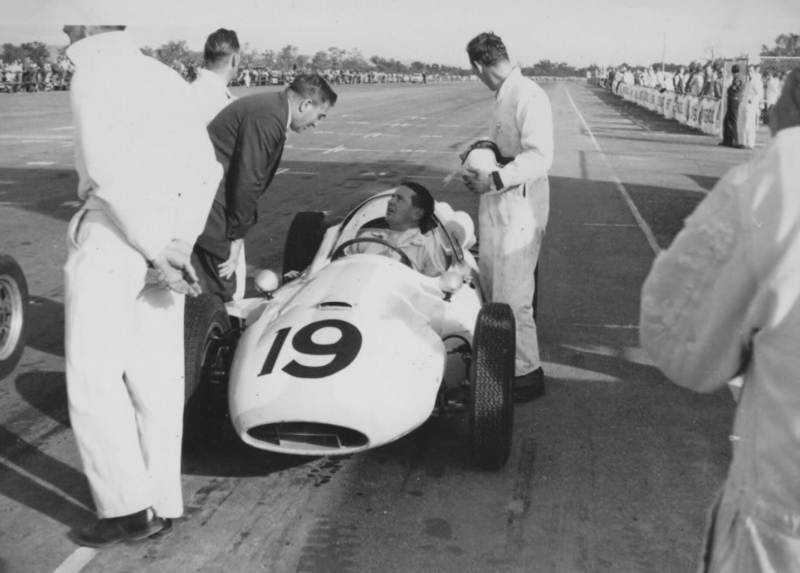 He retired again at the Melbourne Grand Prix at Albert Park in November 1958 and did not take the start of the Longford 1959 Australian Grand Prix, that race won by Stan Jones’ Maser 250F. Bill was 3rd in his heat but knocked a tooth off 3rd gear preventing a start in the GP itself. Again. 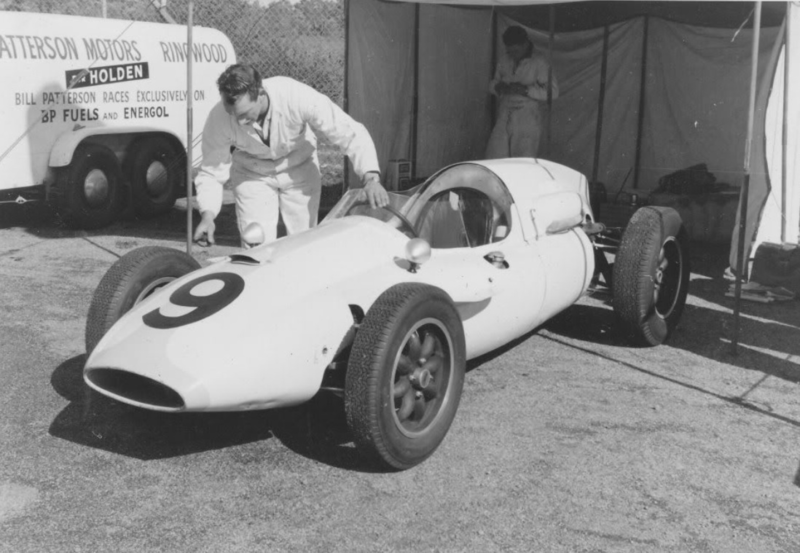 Bill put the car to one side and kept it as a spare which was occasionally raced by Doug Whiteford when he bought a T51 GP Cooper, #F2/15/59, a car supplied less engine in mid-1959. 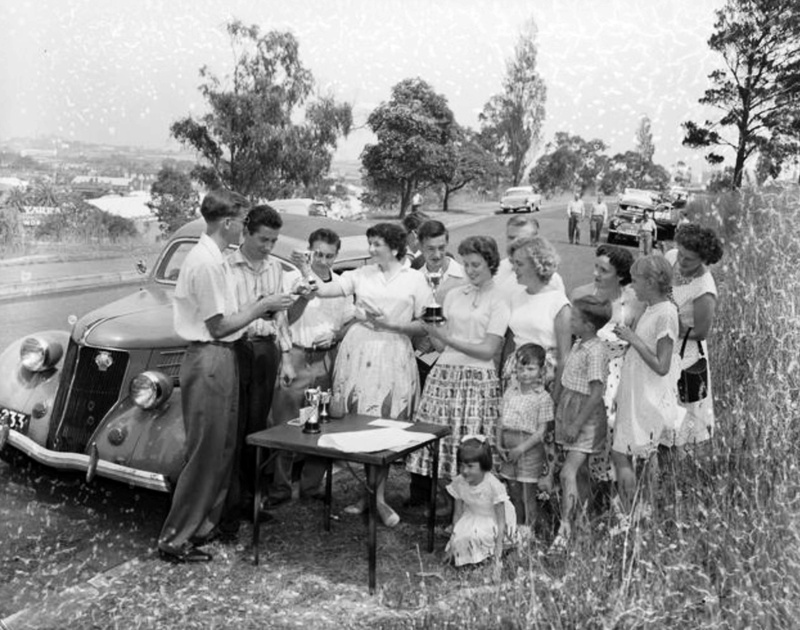 The car was built up in Patterson’s Ringwood dealership by his mechanic, Trevor Hill and made its debut at Port Wakefield in October 1959. 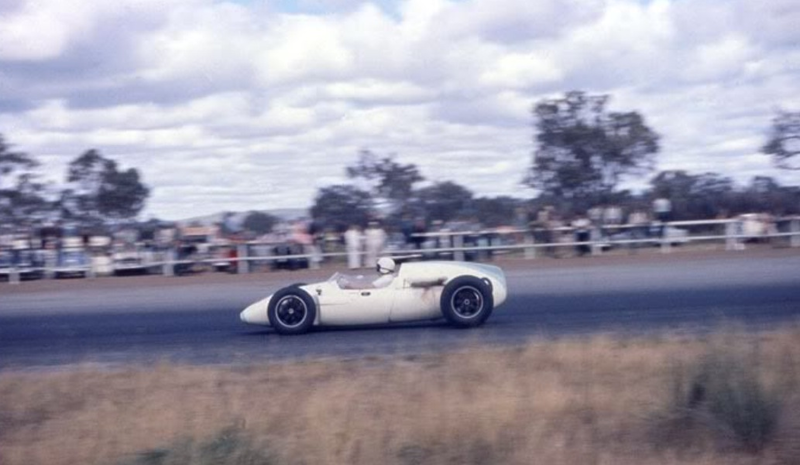 He was 4th in the 1959 Gold Star, using the T43 and new T51 which was fitted with a 2 litre Coventry Climax FPF DOHC engine winning 2 rounds at Port Wakefield and Phillip Island, both in the T51. He went one better, 3rd in the 1960 Gold Star in the Cooper T51 Climax, the car at one stage won 9 times in a row, not at championship level mind you. 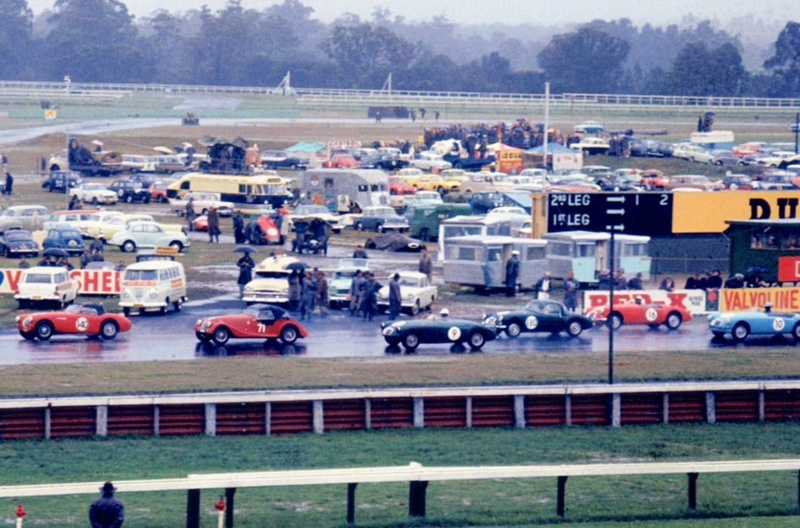 The FPF’s capacity was increased to 2.4 litres by Doug Whiteford by the time of the October 1960 Bathurst International meeting. Despite greater consistency Patto won only the Lukey Trophy at Phillip Island in December. He took seconds at the Island in March, Bathurst in October and thirds at Fishermans Bend and Easter Bathurst. 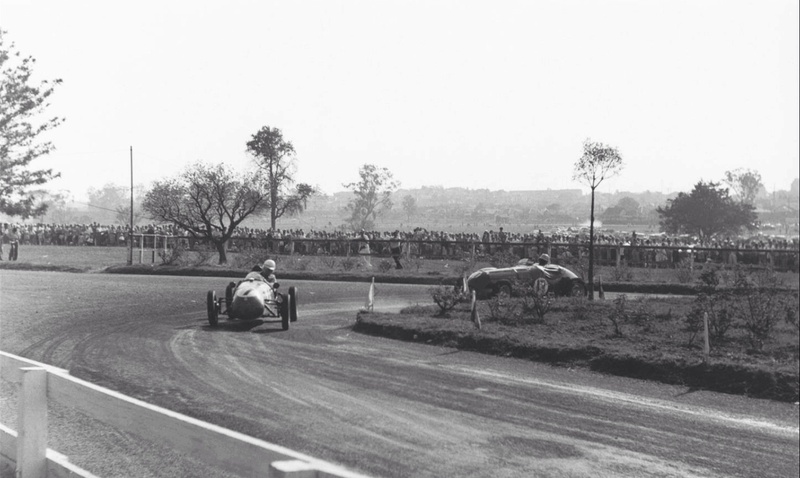 The second place at Bathurst was behind Brabham’s current 2.5 litre T51, Patto was racing his earlier 2.4 litre engined, leaf sprung T51; the drive was talked about for years for its fighting brilliance on this most demanding of road circuits. 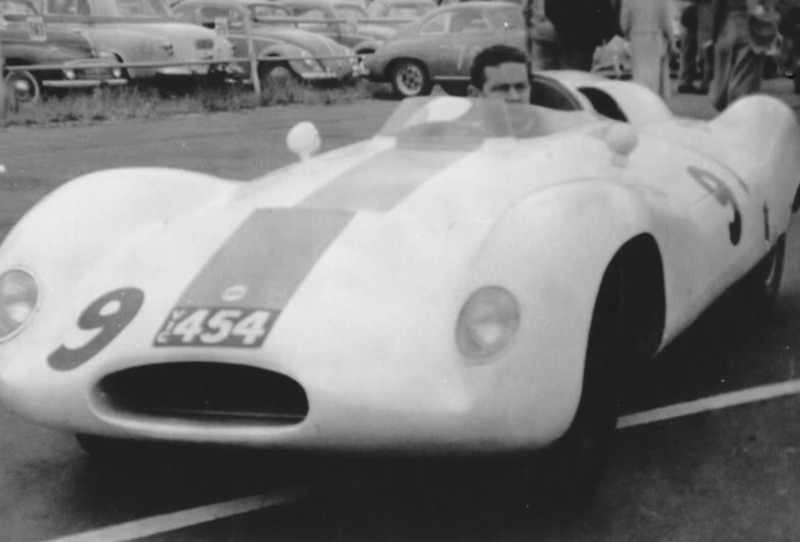 Into 1961 the car was fitted with a full, factory 2.5 litre FPF Patto acquired on a trip to the UK, in this spec he set lap records at all of his Gold Star races. 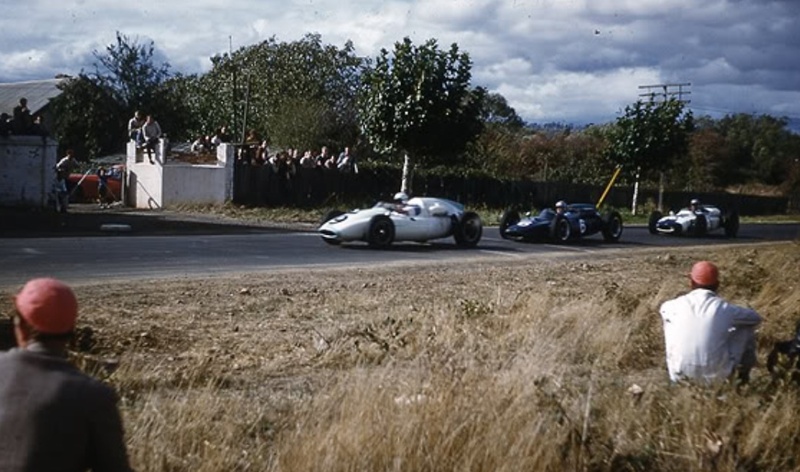 At Lakeside on 16 July 1961 Bill had a huge accident on this very fast circuit, rolling the car, having taken 4 seconds off the lap record earlier in the day and dicing with Stan Jones at the time of the crash. He was badly hurt, the car rooted, albeit the bits which were usable were retained as spares for the replacement, new, T51 Bill bought from Coopers. By then he was well and truly a long-standing ultra-loyal customer! 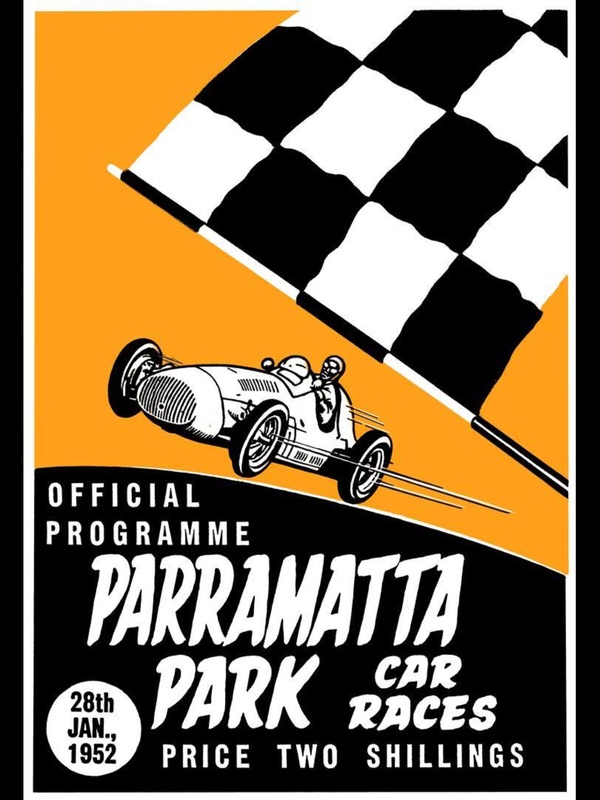 Early in the season Patto was 3rd at Longford in March, a week later going one better with a 2nd to Jack Brabham in a T53 Cooper ‘Lowline’ at Hume Weir circuit at Albury/Wodonga on the NSW/Victorian border. 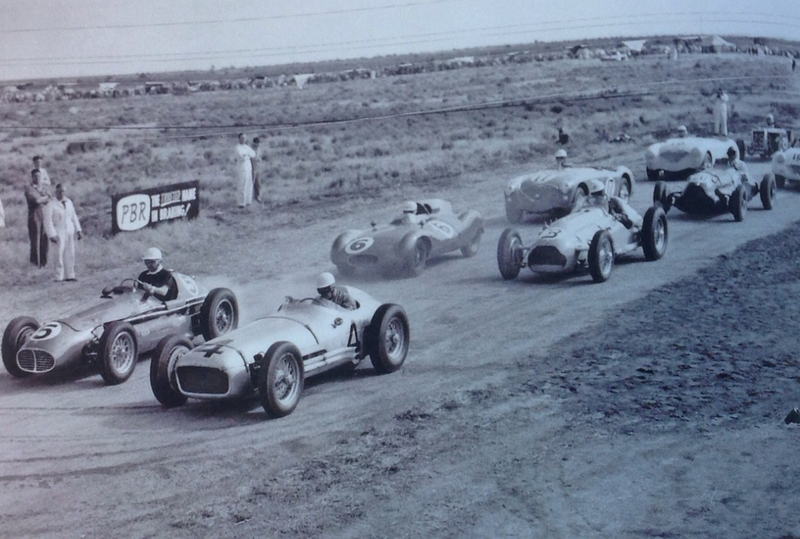 At the following round at the Bathurst Easter meeting Patterson took a great win from Stan Jones, Bib Stillwell, Arnold Glass, Alec Mildren, David McKay and Noel Hall all in Cooper T51’s. 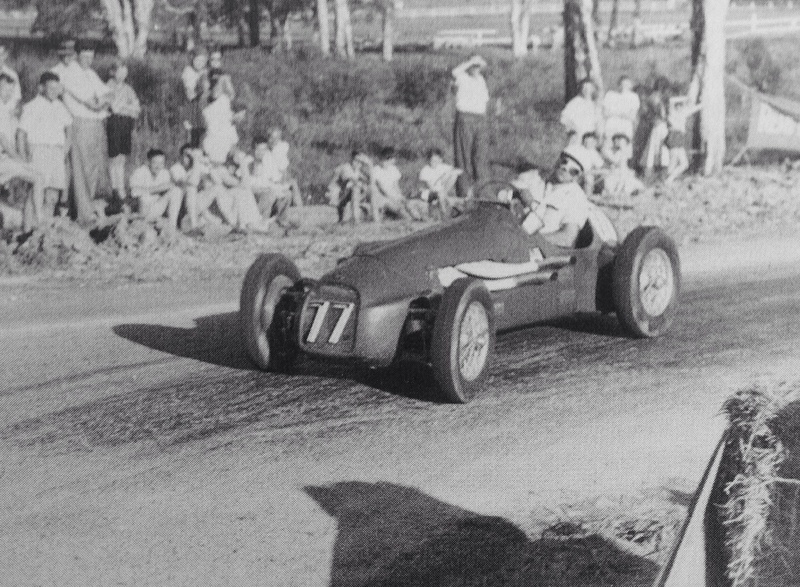 The only other finisher, Queenslander Glynn Scott was 8th in a Cooper T43! Patterson won again at Lowood in June, winning the Queensland Centenary Road Race Championship from Mildren and Jones. 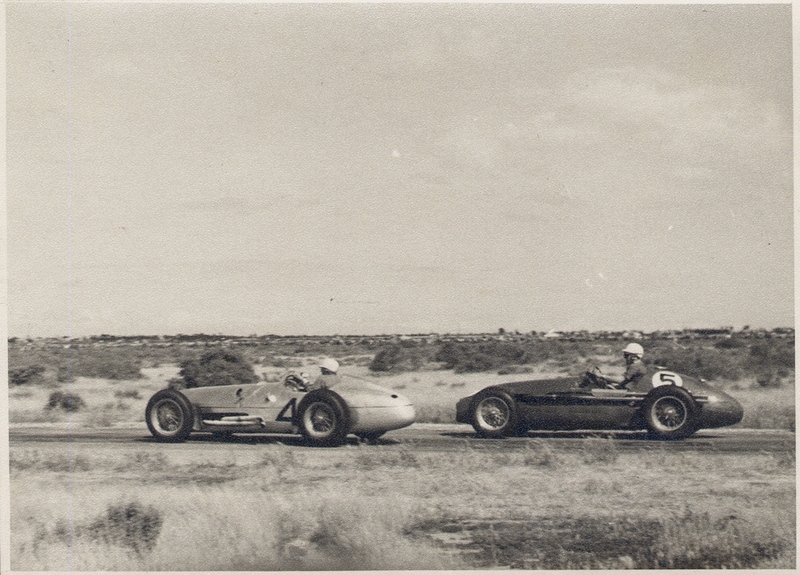 Patterson’s boys towed the new Cooper across the continent to Caversham, Western Australia, the effort rewarded with a win in the 1961 WA Road Racing Championship on August 12. The victory also gave him the ’61 Gold Star. Another long tow to South Australia for the October Australian Grand Prix, at the Mallala airfield circuit, 60Km from Adelaide. Bib Stillwell had imported a T53 Lowline providing Bill with strong competition. Patterson won his heat in a good start to the weekend and started the race from pole, there was a good deal of ill-feeling amongst the drivers as to time-keeping. McKay got the jump at the start-too much so according to the officials! By the end of lap 1 Patto was in the lead from McKay, Davison, Youl and Stillwell. Patto pulled away at a rate of 1.5 seconds per lap, McKay was penalised a minute on lap 20, 5 laps later Pattersons Cooper was misfiring. Patterson stopped twice, but returned after the problem, vapour lock, was solved. McKay led Davison on the road but was effectively 3rd with his penalty. Davison again took a contentious AGP win, in a Cooper T51 borrowed from Stillwell, this time the controversy over an alleged jump start by McKay, the resultant penalty cost him the race. 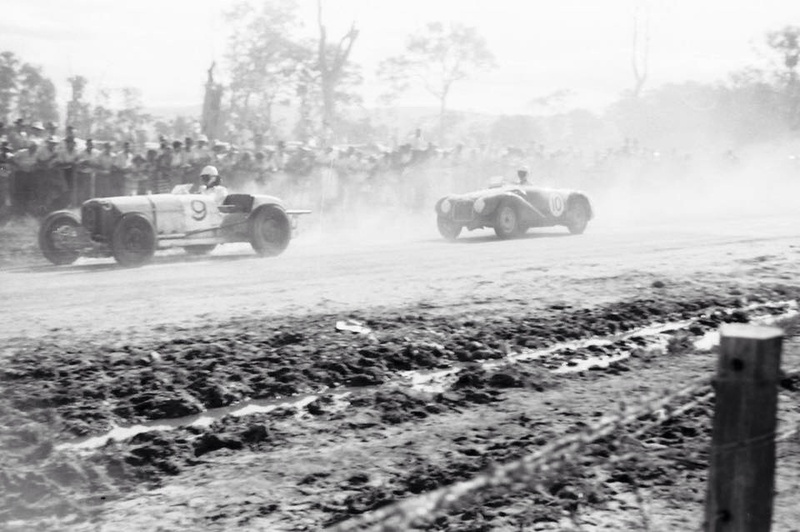 The shame though was Bill’s retirement, it was a race which was ‘his’, by that stage Patto was also very much a master of his craft, a driver of great experience, speed, and ‘tiger’. He was a man who was ‘high born’ but boy he drove with hunger! 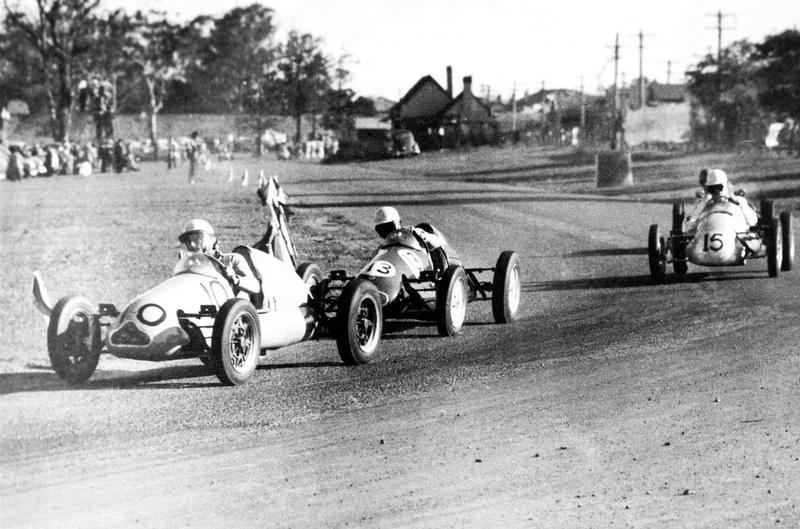 With his two wins at Bathurst and Lowood, Patto won the Gold Star title by 36 points from Lex Davison’s Cooper T51 and Bib Stillwell’s T51 and T53. Into 1962 he raced on but the T51’s raced by Patto and others were becoming less competitive as chassis design rapidly advanced, the Brabham BT4 probably the pick of the ‘Intercontinental’ cars at the time. 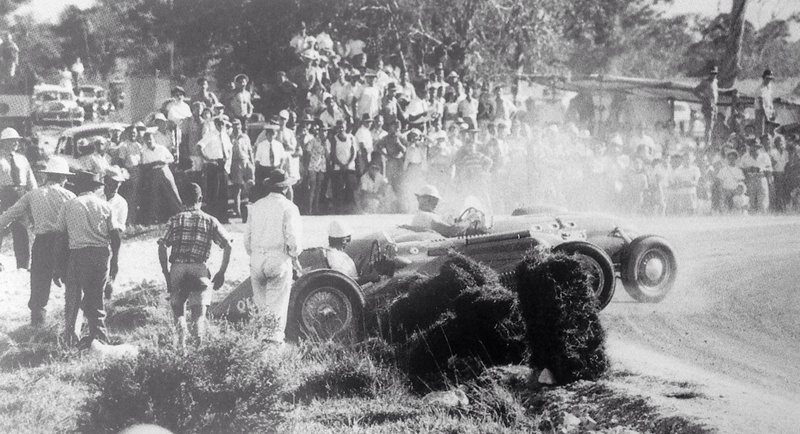 3rd was therefore a good result in the Gold Star in a season in which he raced sporadically. He was first Australian resident in the Sandown International, the circuits opening meeting in March 1962, was 3rd in the Bathurst 100 at Easter not racing again until the Victorian Road Race Championship, at Sandown his home circuit in September where he was 3rd behind Davison and Stillwell’s later Cooper T53’s. 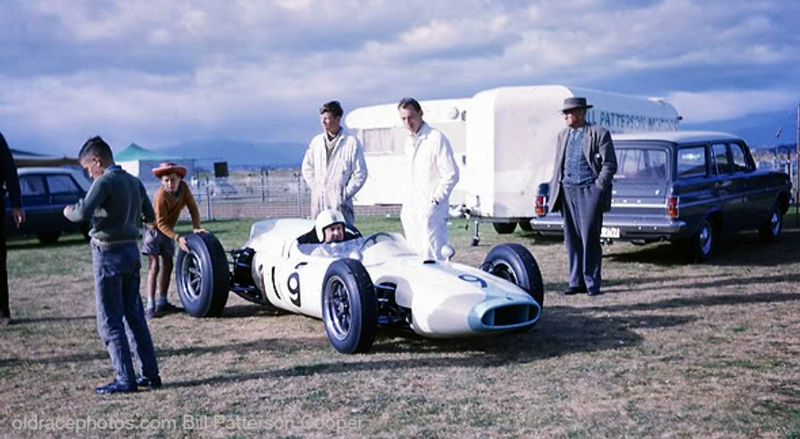 Patterson contested the AGP at Caversham in November, 4th a good result behind the latest equipment but the T51 was three laps behind McLaren’s winning Cooper T62, the car Bruce used to good effect in the 1963 NZ and Australian Internationals. 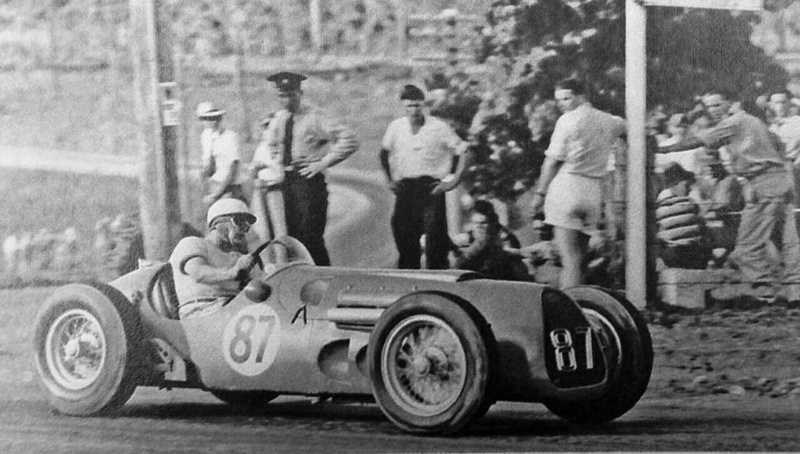 Patterson was 6th in the Gold Star in 1963 but only raced his ‘Lowline’ Cooper T53 Climax sporadically. 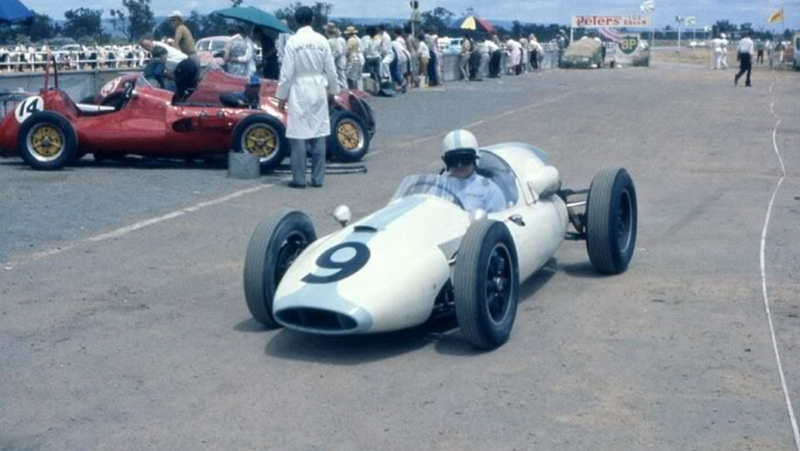 He bought this car from Bib Stillwell, #F1/5/61, the car probably a chassis used by Brabham and Surtees in Intercontinental events in the UK in mid 1961. 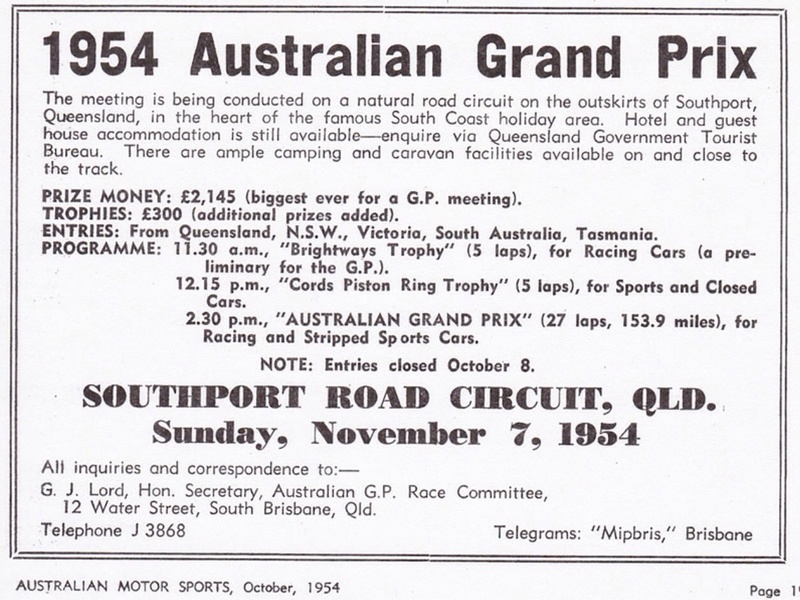 Bib raced it in 1962, a win in the Mallala Gold Star round in October his best result. 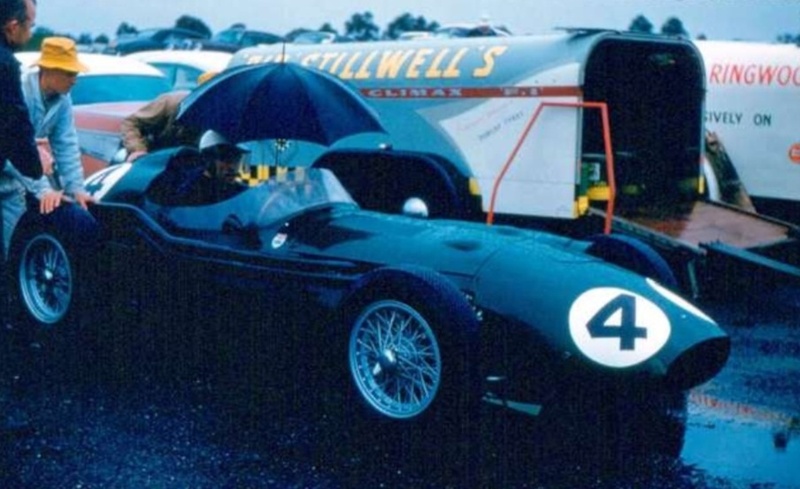 Bill’s first race in the T53 was the Sandown International in March where he was a DNF with gearbox failure. He raced it again at Sandown in September, very close to home for Bill, the circuit was only 10 km from his Ringwood Holden Dealership, and retired again from the Victorian Road Racing Championships. The speed was still there though, he was 3rd in the Hordern Trophy at Warwick Farm in December. 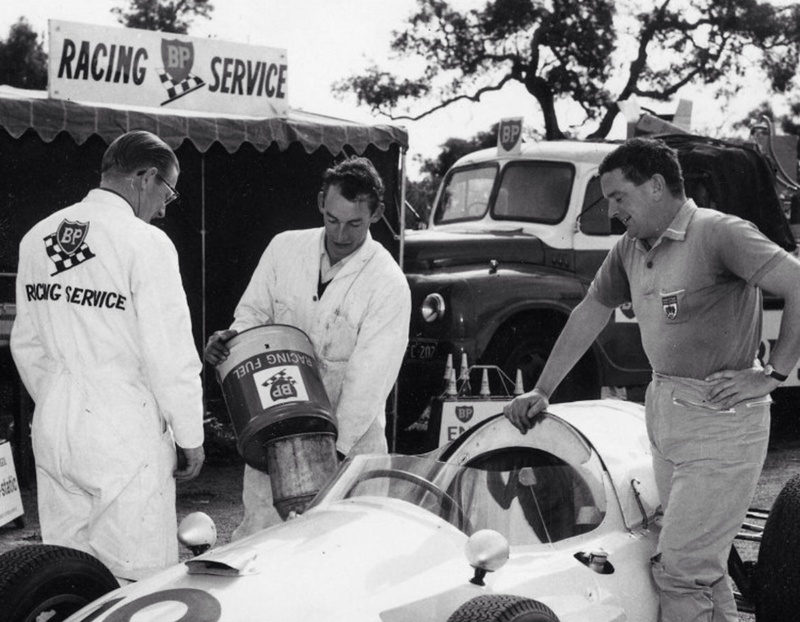 Patterson raced on into 1964, he was 41 and dealing with a growing business and it’s attendant pressures. There was a credit squeeze in 1961 caused by the federal governments responses to the growth of inflation at the time; it knocked the socks out of the economy and many highly geared motor traders, not least his friend Stan Jones, so perhaps that was a factor. Mind you, the Patterson family wealth meant that Bill’s access to working capital would have been greater than most. 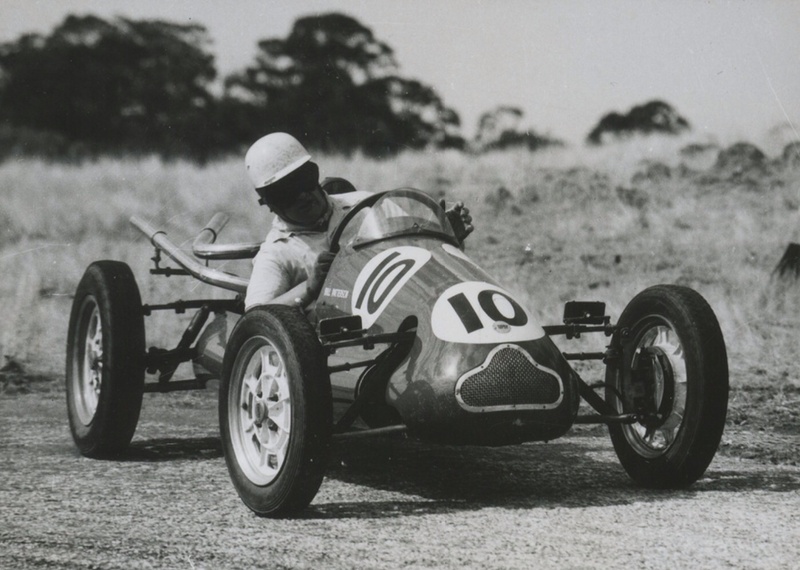 In any event, he contested the Sandown and Longford rounds of the inaugural Tasman Series in 1964, in fact Longford was his last championship drive. For one who had raced so long, his was a relatively quiet retirement. 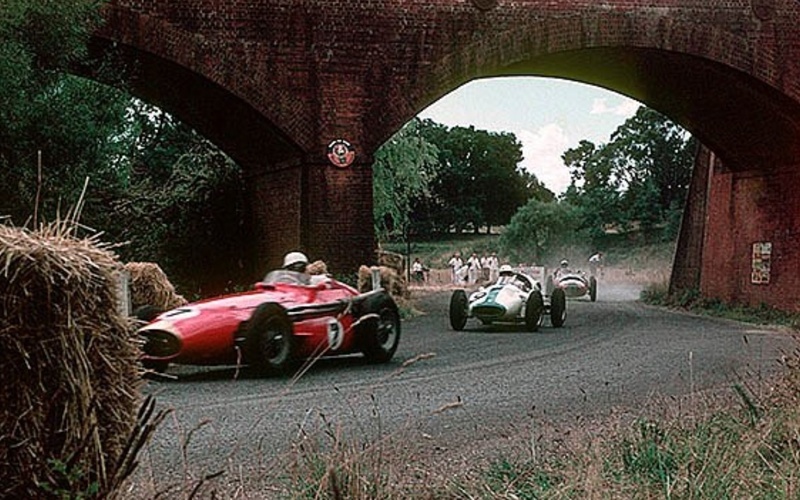 I well remember one drive when Bill raced/demonstrated one of his Coopers in the ‘Tribute To Fangio’ meeting at Sandown in 1978, the YouTube footage of that ‘race’ between Brabham’s Brabham BT19, his 1966 championship winning chassis and Fangio in a Benz W196 well worth a look. Longford was the end of a long career which commenced way back in ’46 at 23 years of age. Patterson focused on his growing business starting a long period as the sponsor or supporter of other drivers by acquiring the ex-McLaren/Mayer Cooper T70 Climax which was raced by John McDonald for a couple of seasons before its sale to Don O’Sullivan in 1967. This is the car now owned by Adam Berryman in Melbourne, it’s history chronicled not so long ago in my article about Tim Mayer. Cooper historian Stephen Dalton observes that Bill Patterson ‘had the longest run of anyone using Cooper chassis, starting in 1951 in England/Europe through to 1966 when he was running McDonald’. 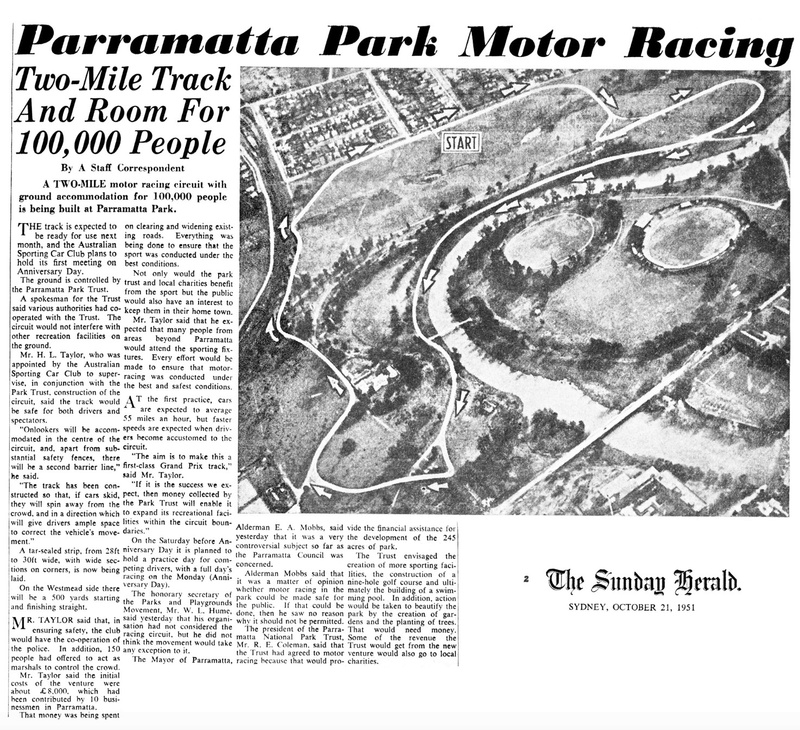 Patterson’s business interests centred around his large Ringwood, outer eastern Melbourne, car and truck dealerships ‘Patterson Holden’ / ‘Patterson Cheney’ and later ‘Bill Patterson BMW’, as covered earlier in this article. 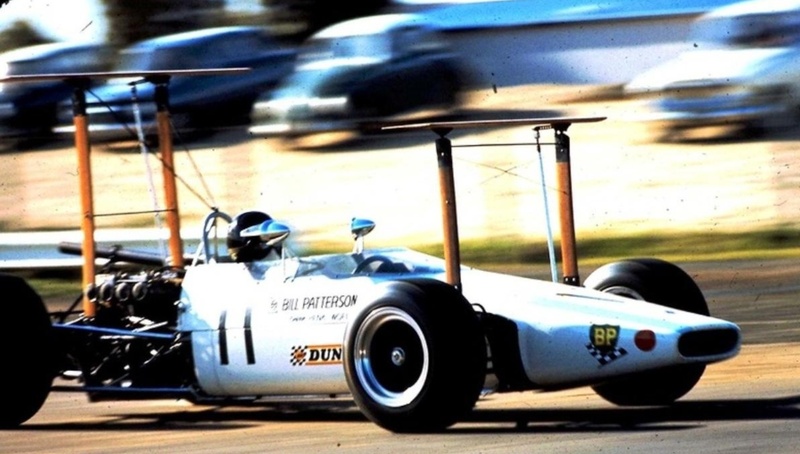 Drivers Patterson supported included Henk Woelders who won an Australian F2 Championship in an Elfin 600E Ford and Peter Brock’s Holden and BMW Le Mans Touring Car campaigns. He also sponsored Alan Jones 1977 Rothmans F5000 Series assault in Teddy Yip’s Lola T332 Chev. 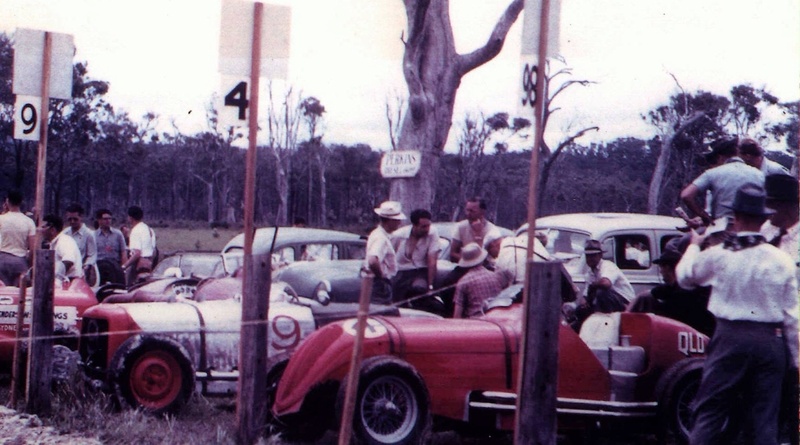 Patterson was a mainstay of support for the Holden Dealer Team in its various incarnations, the performance of that team in production or production based touring car races important brand positioning for The General over the years. Many elite drivers have also been motor traders across the globe, in Australia there are quite a few who put more back into the sport than they took out, Patto was one of those. Bob Jane, Alec Mildren, David McKay and Ron Hodgson are others who spring to mind, not the only ones mind you. Even though his businesses had been highly profitable down the decades, in his later years his fortunes changed. He sold out of his dealerships and invested in an air transport business which serviced the islands in Bass Strait between the Victorian mainland and Tasmania. Unfortunately the business was unprofitable and sustained considerable losses. Bill lived comfortably with his wife albeit on a different level than that to which he was accustomed, he died on 10 January 2010 at Karinya Grove aged care facility, in the well to do Melbourne bayside suburb of Sandringham aged 86. 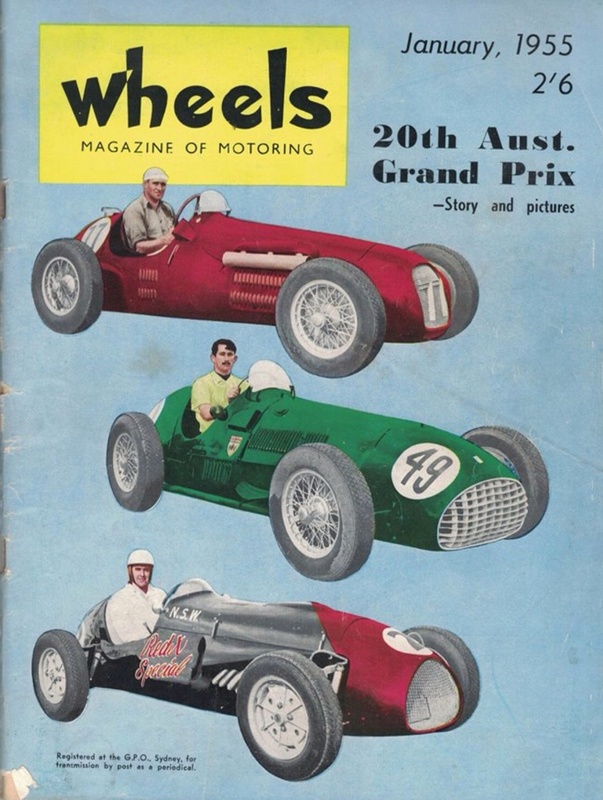 ‘Australian Motor Racing Annual 1964’ rated the Top 20 as Frank Matich, Bib Stilwell, John Martin and Leo Geoghegan and then in no particular order Lex Davison, Bill Patterson, Bob Jane, Ian Geoghegan, John Youl, Greg Cusack, John French, Brian Muir, Norm Beechey, Peter Manton, Brian Foley, Harry Firth, Bruce McPhee, Keith Rilstone, Jack Hunnam and Glynn Scott. Depressing is that about 70% of this lot are Taxi Drivers, that is Touring Car racers. Of Patterson the annual said ‘Ah Patterson. Still the most spectacularly fast of all Australians, Bill Patterson races when he feels like it and always uses all the road and part of the verge. In the past he has been renowned for some fiery displays on the grid and past it; in a competitive car he is on his day, always the man to beat’. 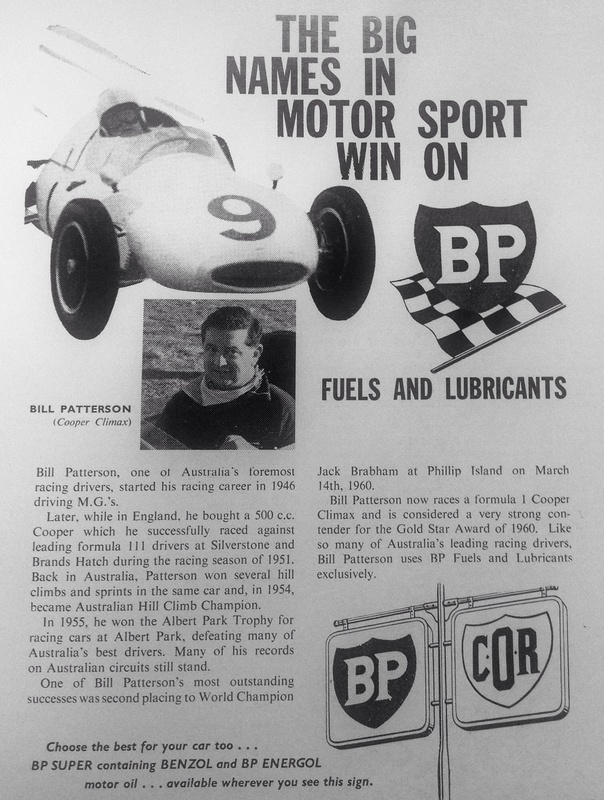 Lex Davison in his Australian Motorsports magazine column wrote of Patto in relation to the 1963 Hordern Trophy at Warwick Farm ‘…meanwhile our fastest driver, Bill Patterson, lacking recent activity, was rough and unpolished’. David McKay, racer, team owner and journalist always described Bill in his columns as ‘The Hare’ to indicate his outright pace. 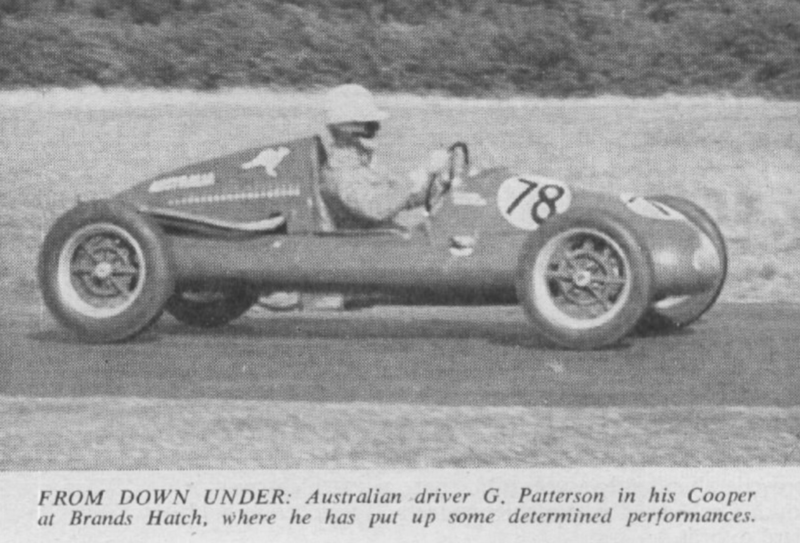 Patterson proved he could ‘cut it’ in his brief F3 stint in UK/Europe in 1951, in many ways it’s a pity, given his growing wealth that he didn’t acquire an outright contending car when he returned to Oz then. 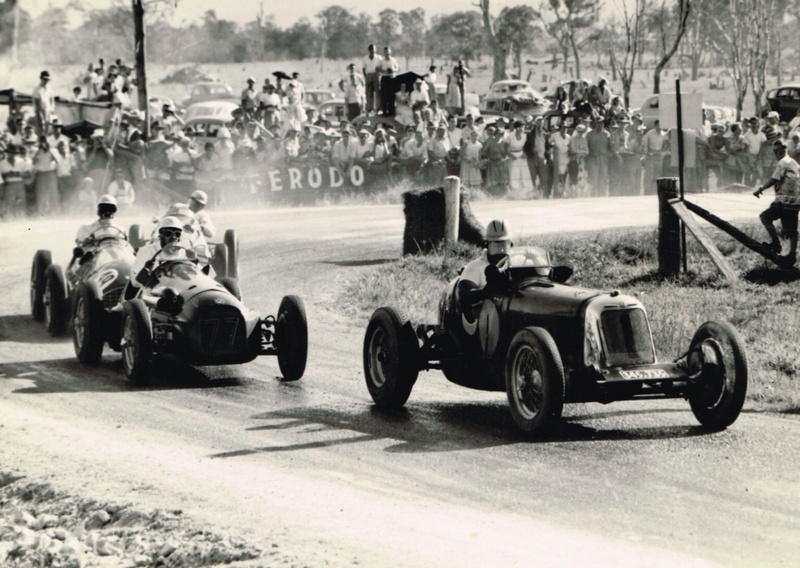 To have seen Patto go toe to toe in the mid-fifties in equivalent machinery to Davison, Jones, Hunt, Stillwell, Mildren, Whiteford, Gray, McKay and others would have been really something. I chucled when i saw this fine shot by Ken Devine of Bill’s Cooper T51 and its ‘Rice’ Trailer in the Caversham paddock, Western Australia in August 1961. From Patterson’s Ringwood base to Caversham trip is about 3440 Km, from Australia’s East to West Coast, London to Moscow is only 2870Km. 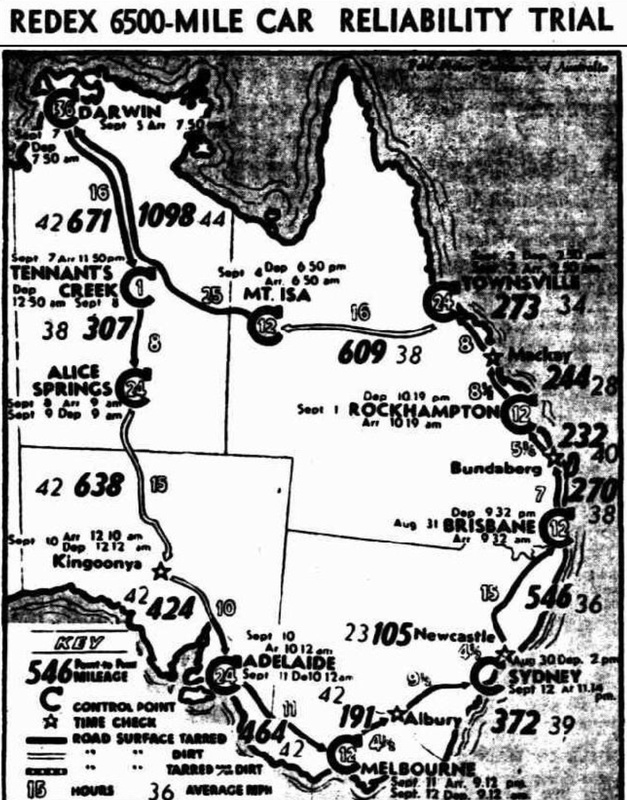 The road then was a shocker too, the Eyre Highway was not much more than a track in the 1940’s and 1950’s, the West Australian section was sealed in 1969 but the South Aussies didn’t do their bit until 1976. Special thanks to ace researcher and Cooper historian Stephen Dalton for his assistance in identifying or confirming venues, dates of race meetings and which Cooper is which! Any errors are mine.